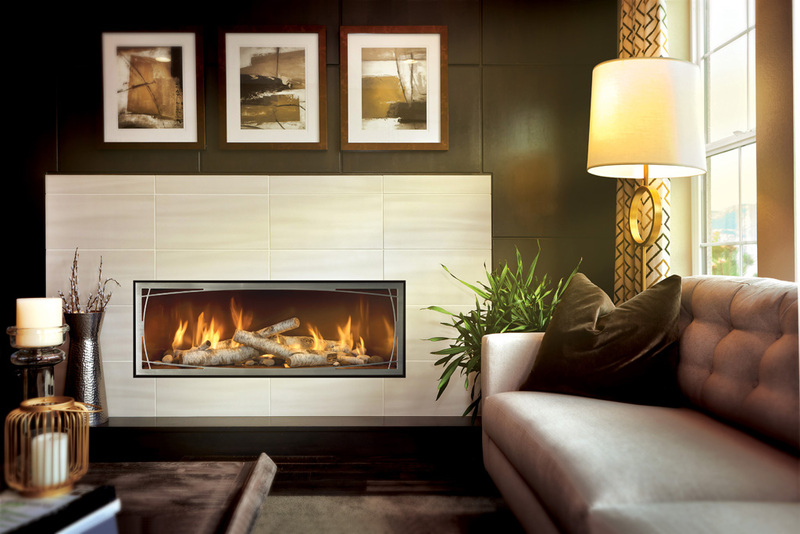 Whatever your taste and life style, Colony has the right fireplace in gas, wood, or electric to fit your needs perfectly! Stop by our showroom to see the over 40 different models on display and have our experienced staff answer your questions. We can take care of everything from concept to completion. 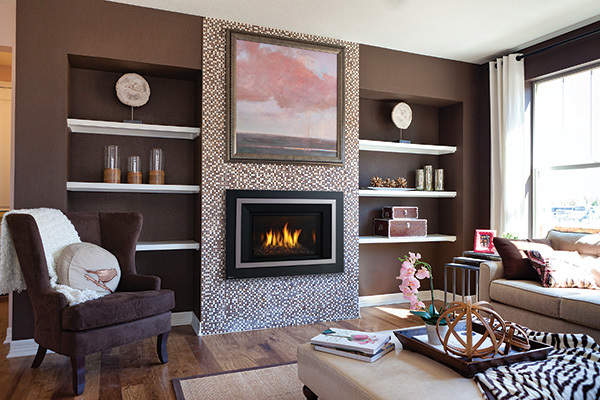 There are many options to choose from when starting from scratch on a fireplace installation. 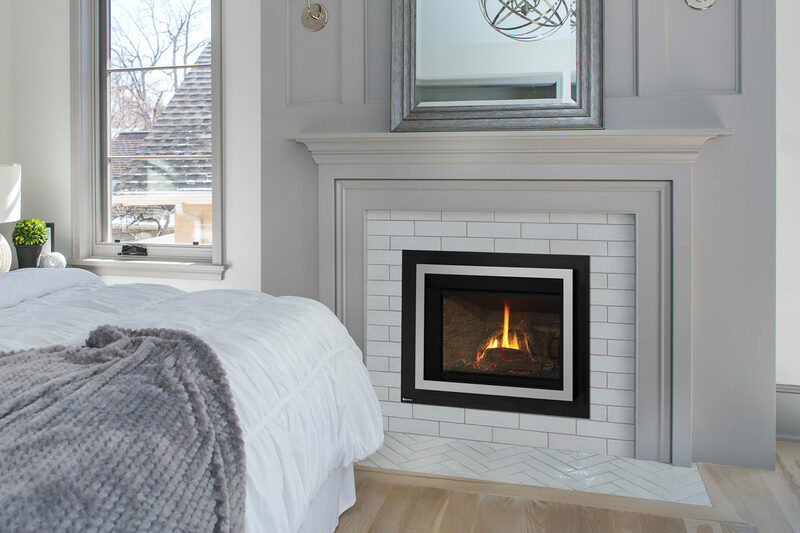 When we say the term fireplace, we are talking about installing a "firebox" in front of an existing wall or building the box into a newly constructed wall. 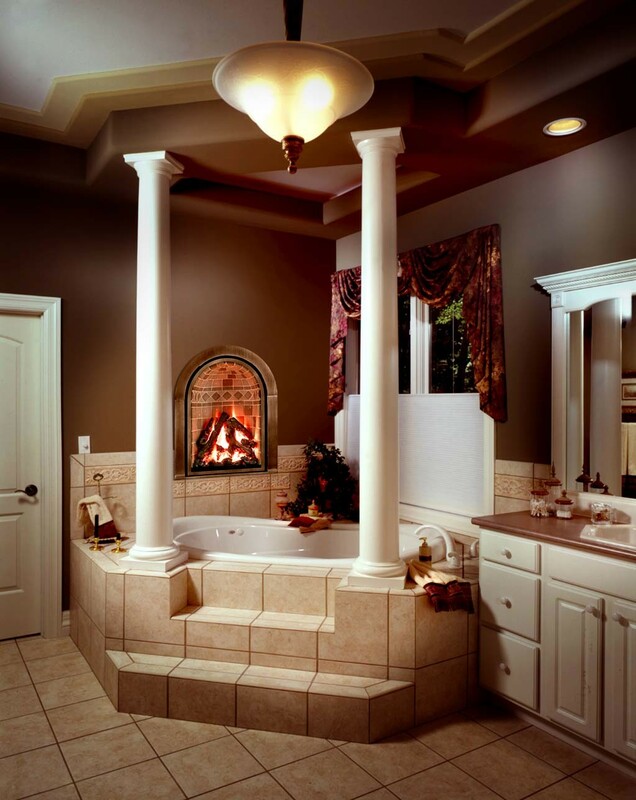 From contemporary to traditional, the possibilities are endless! Below are all of the possible fuel options available and information that you will find helpful during your design process. Click the Gas, Wood or Electric tabs. Direct Vent: This is the most popular in our area. It uses a concentric pipe that can be rear vented straight out the back of the unit, up off the top and out the wall or straight out the top of the roof. Vent-Free: This uses no chimney and is 99.9% efficient. This is not code to install in most counties in our area. B-Vent: B-Vent takes its combustion air from the home and has to vent through the roof. These units run approximately 50-60% efficient and ar not as popular in our climate. 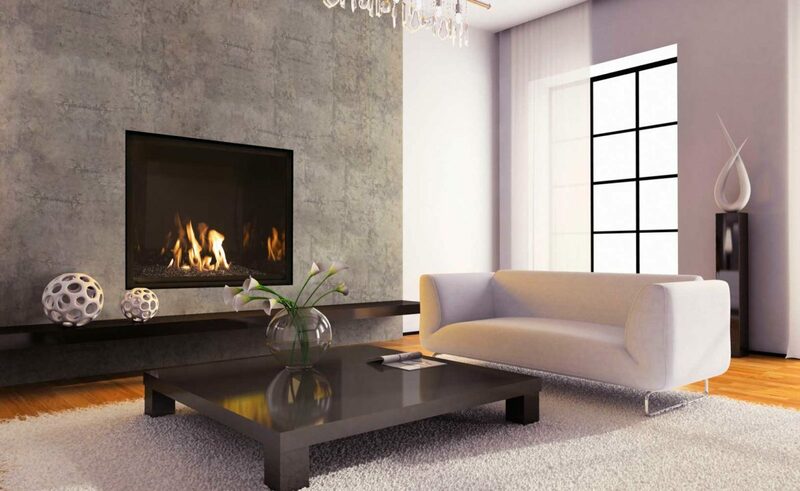 Gas fireplaces add ambiance and warmth to any room of the home - all from the touch of a button. 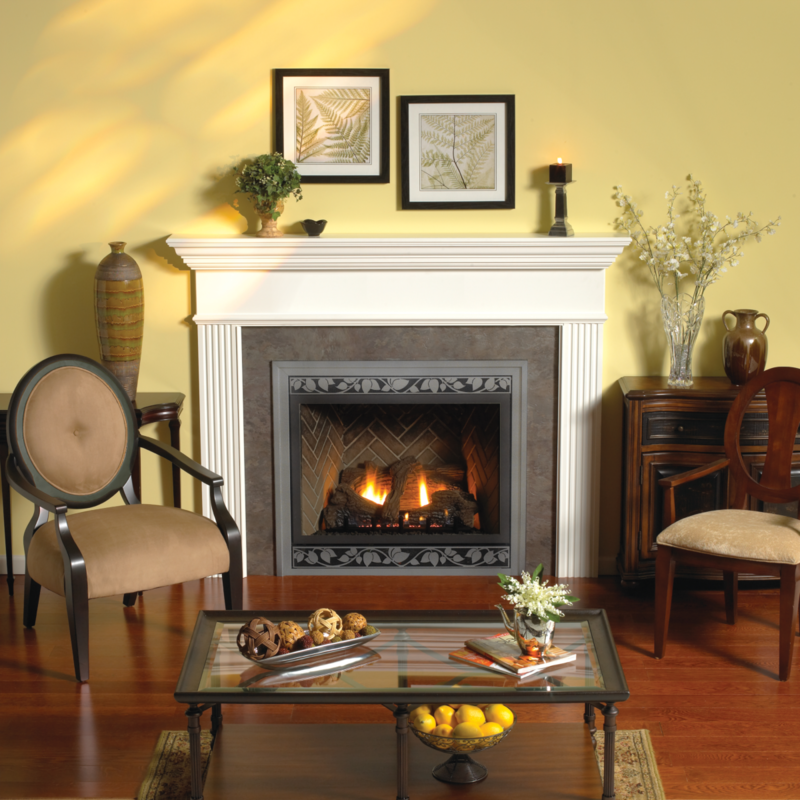 Enjoy the comfort of a gas fireplace in your home with benefits that include cleanliness and efficiency. 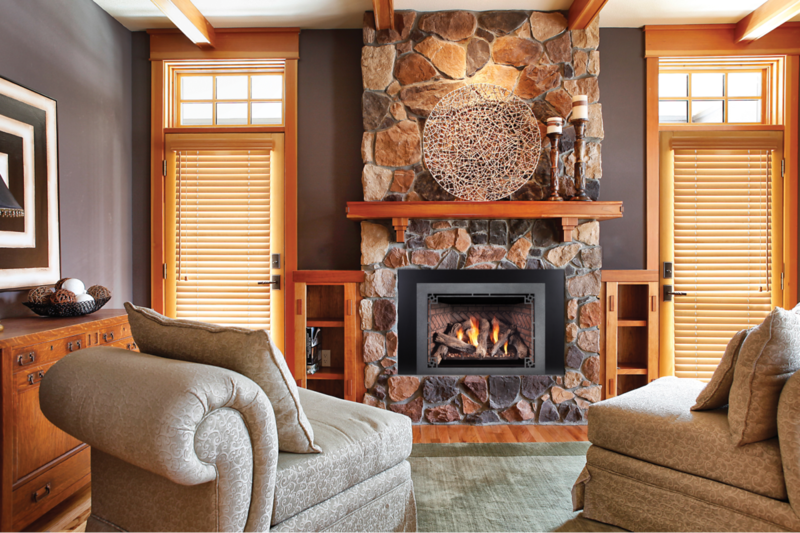 Today’s woodburning fireplaces allow homeowners to enjoy a wood fire and still benefit from innovative technology in heating and efficiency. We offer a variety of sizes and styles. 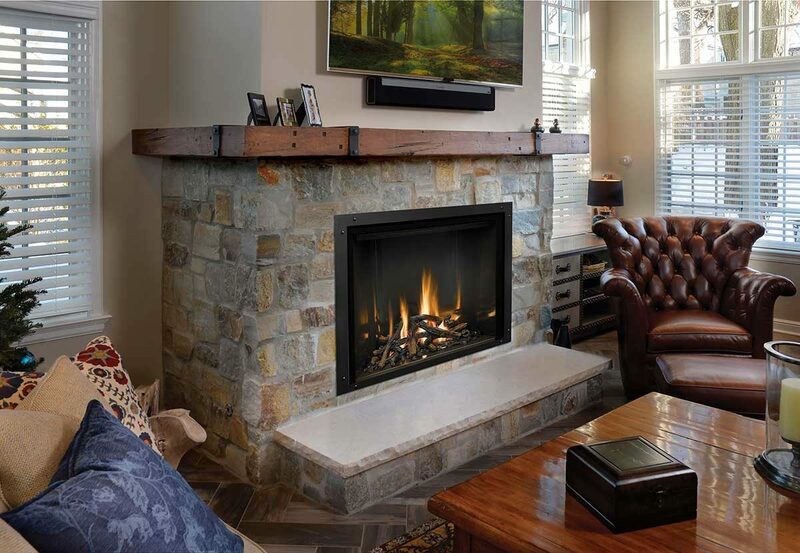 Standard Decorative Fireplace: These fireplaces use air cooled pipe and run about 40% efficient with doors that open to enjoy the natural smell and crackling sound of a wood fire. 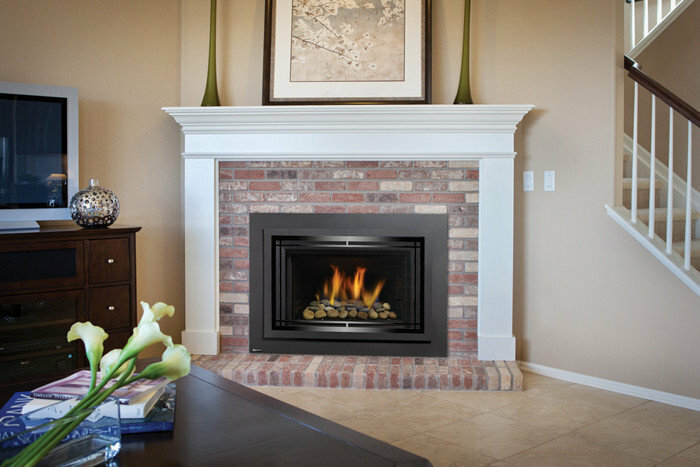 Mid-Efficiency Fireplace: These units also have doors that open to enjoy the fire, but also have features to help make them 50-60% efficient and can use air cooled or solid-pak class a chimney pipe for higher efficiency. 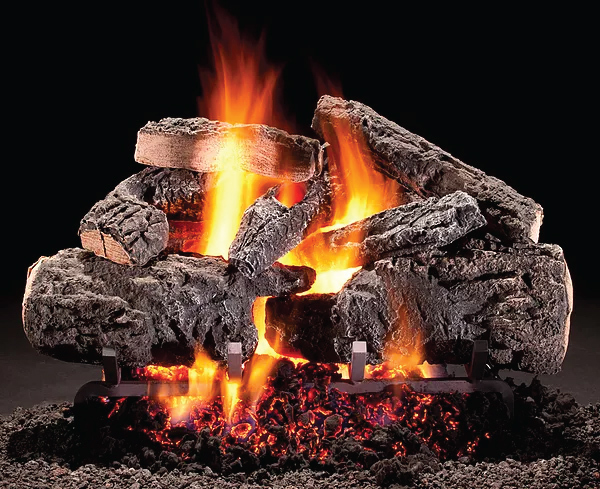 Hi-Efficiency Fireplace: High-efficiency fireplaces are air tight and control the combustion air that the fire uses to create efficiencies of up to 75%. These units use air cooled pipe or solid-pak to increase efficiency and ease of operation. Stop by and check out a variety of models on display in our showroom. Let us show you some of these great features! 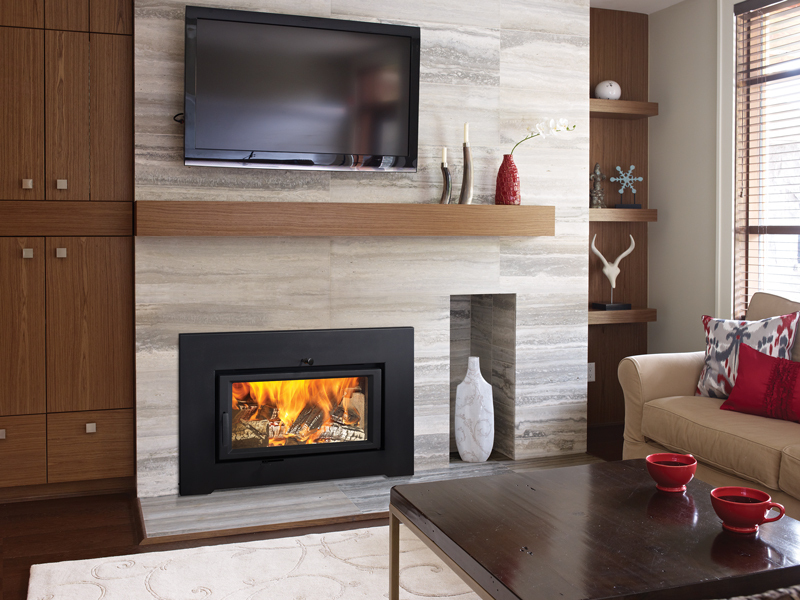 Electric fireplaces have come a long way from the orange light bulb and silver tinsel from years past. Everything from traditional to contemporary. Installation takes just minutes. Simply assemble, and plug it in! 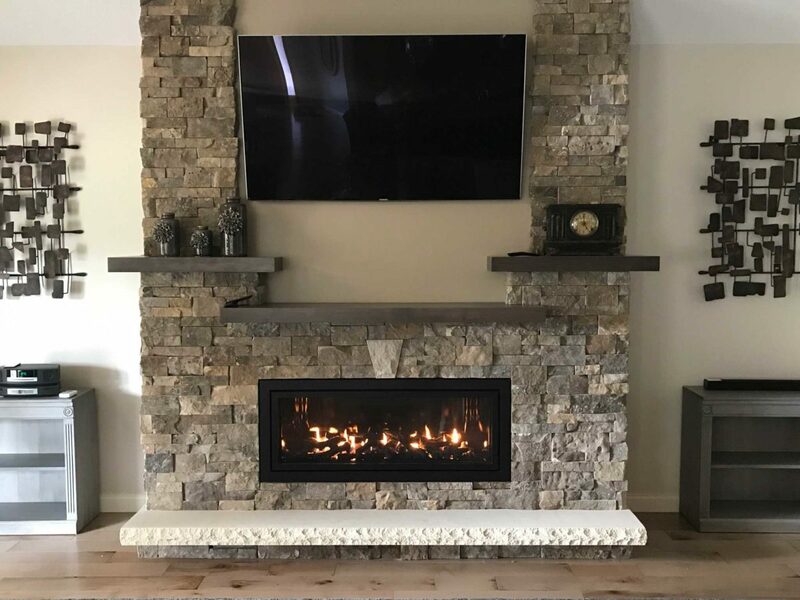 We have a variety of electric fireplaces on display with an array of different mantle styles to fit any decor and price range. They also have 5,000 BTU heaters to help make the space warm and cozy for those cold winter nights! 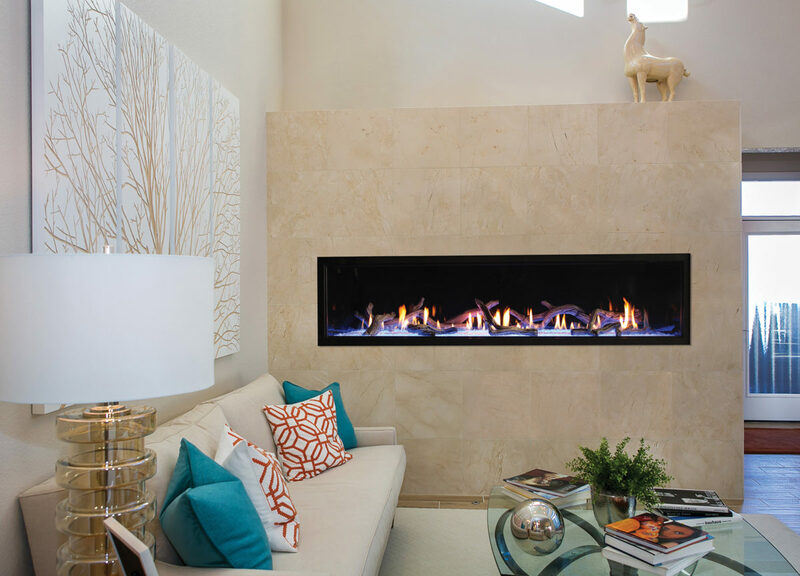 A contemporary fireplace can be the perfect focal point for any room. 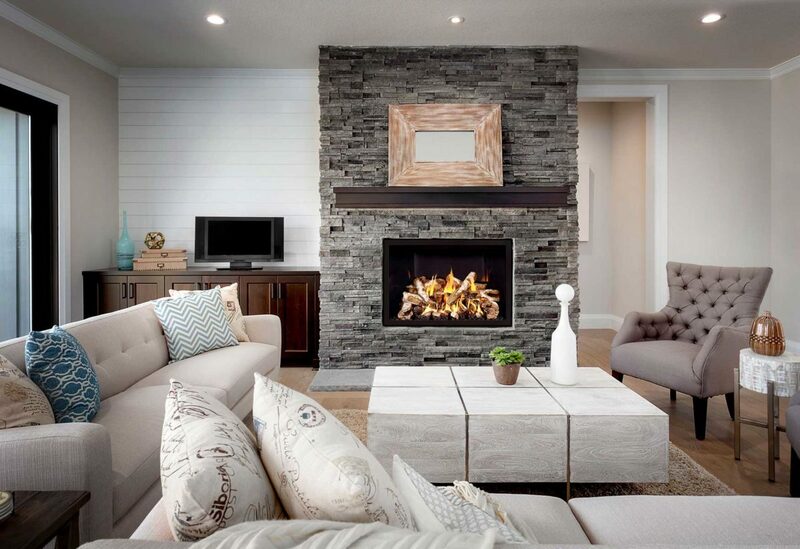 Linear, or contemporary fireplaces offer a cleaner, more modern design when compared to a traditional gas fireplace. 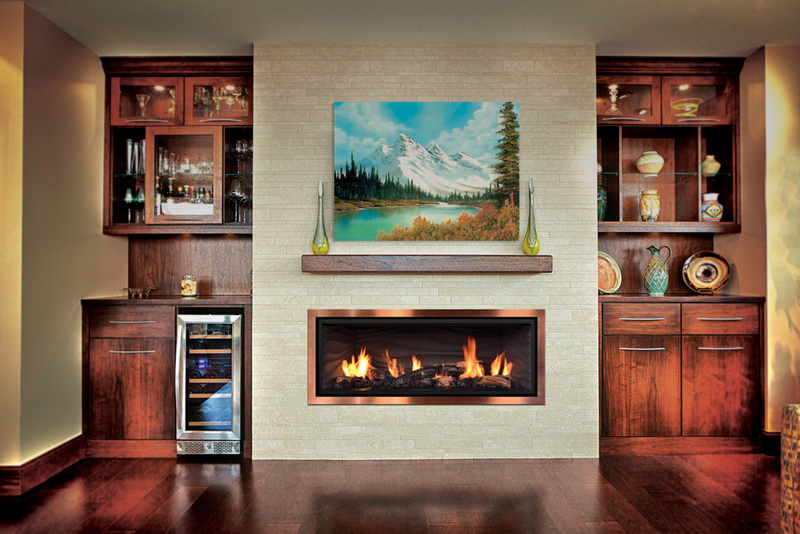 These fireplaces offer time tested technology and stunning natural fire-scapes. Stop by our showroom today or call to setup your free installation consultation. 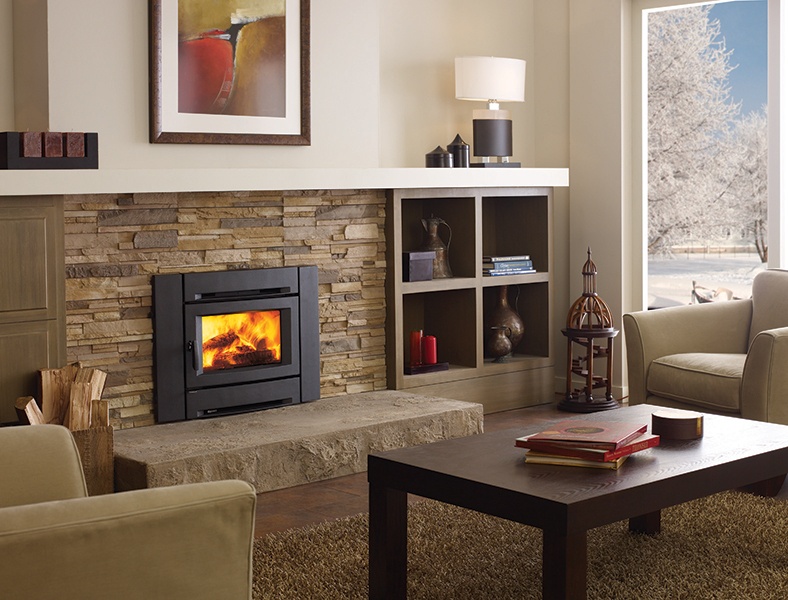 Today's stoves come in various colors, sizes and styles to fit any decor. There are also varieties of venting and variations. Stop by our showroom to learn more! 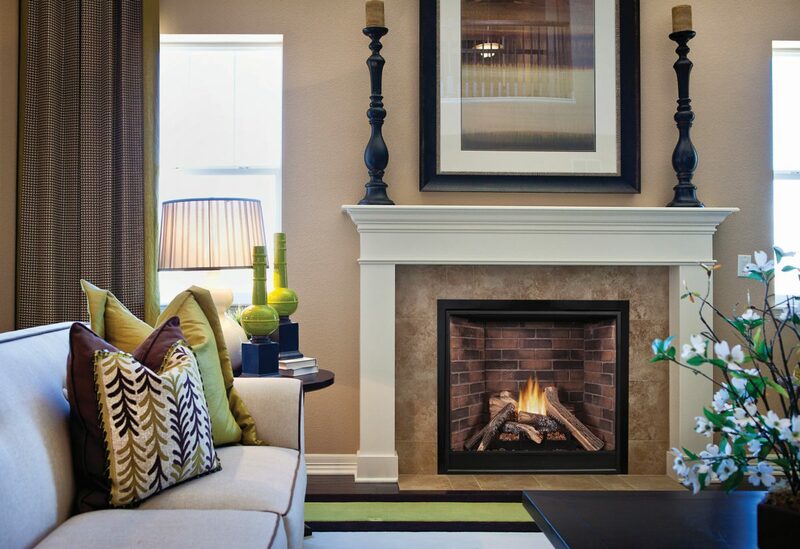 There are many options for you to choose from when making the decision on which stove to add to your home's decor. Along with fuel options - the finishes, shapes and styles are endless! 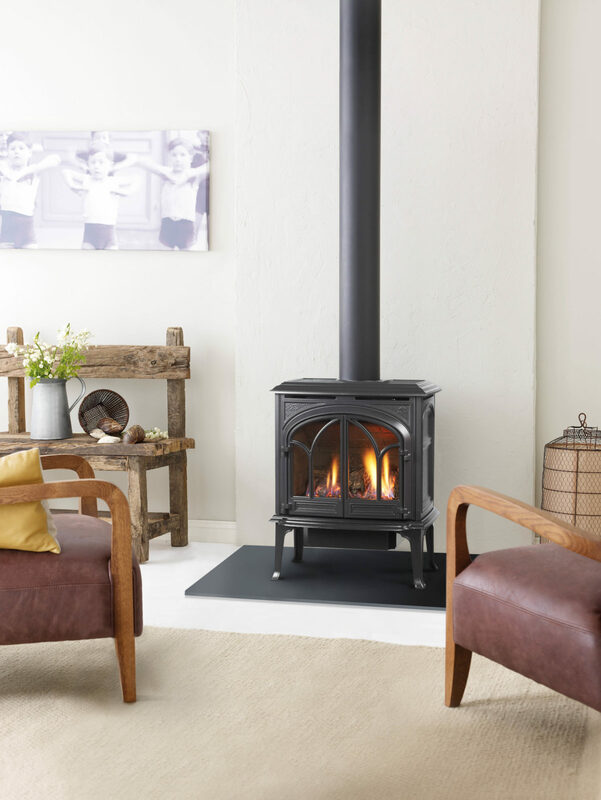 Here at Colony Heating, we strive to bring in the new along with keeping the more traditional styles; ensuring we really do have something for everyone! 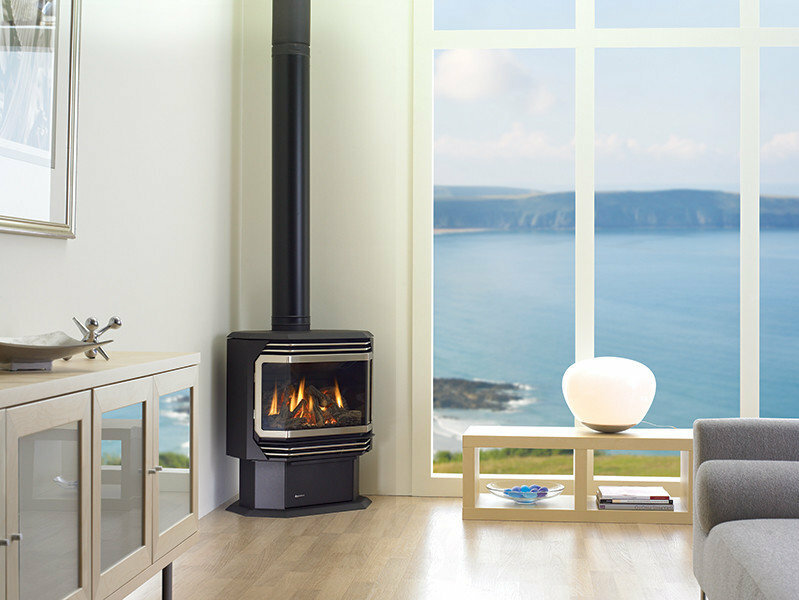 Below you will find the fuel options available for stoves and information on how to decide which one is right for you! 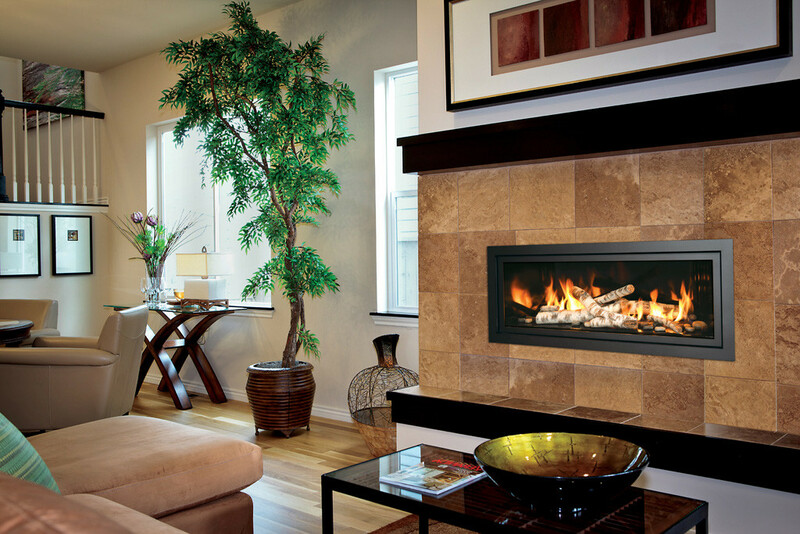 Today gas stoves come in various colors, sizes and styles to fit any decor. 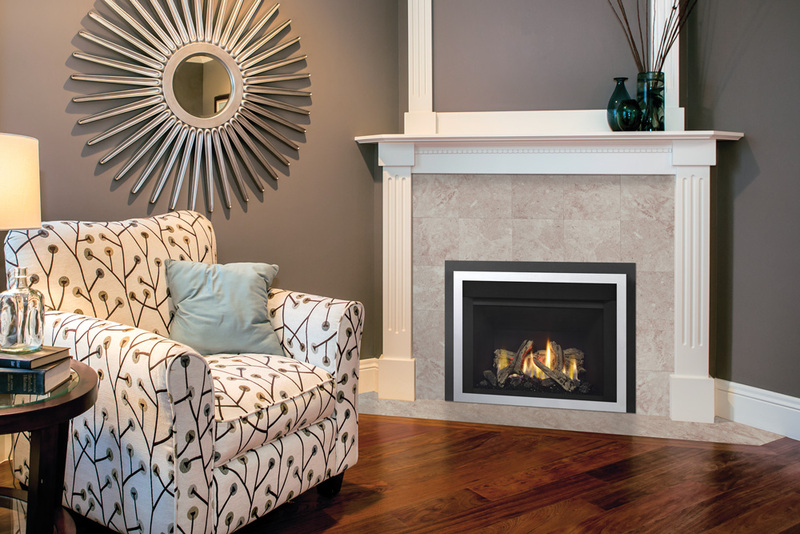 Gas stoves come in B-vent and direct-vent. 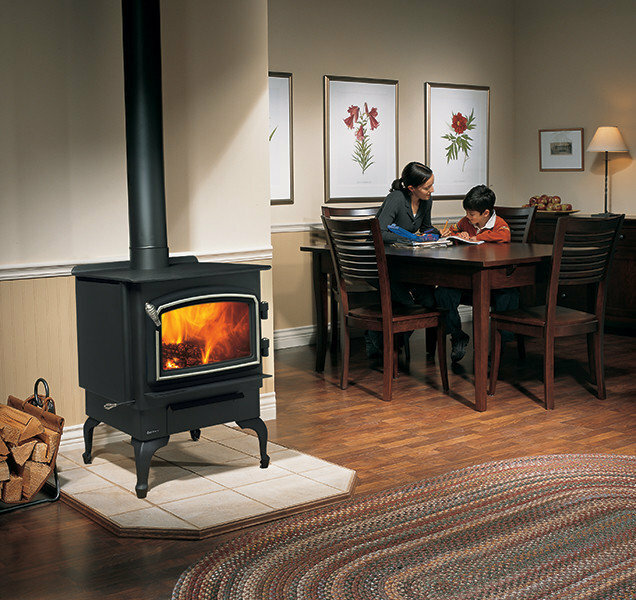 Direct-vent stoves are the most popular. They can be vented straight out the back wall or off the top and through the roof. 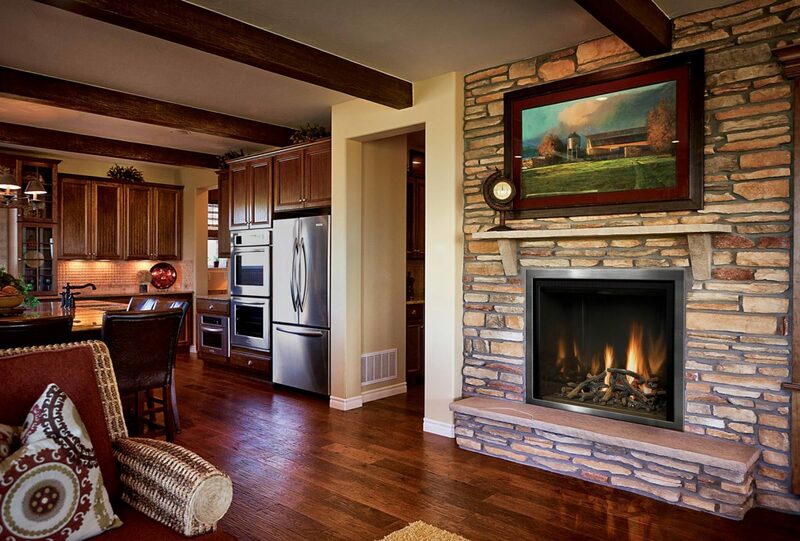 Vent-free stoves use no chimney and are 99.9% efficient. Please make note that vent-free are not code for this area. 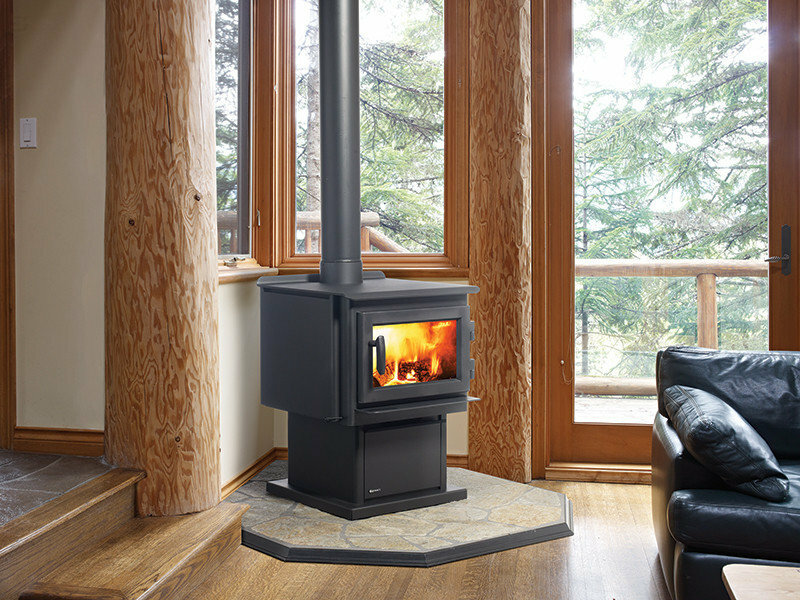 B-vent stoves take their combustion air from the house and have to vent through the roof for approximately 50-65% efficiency. 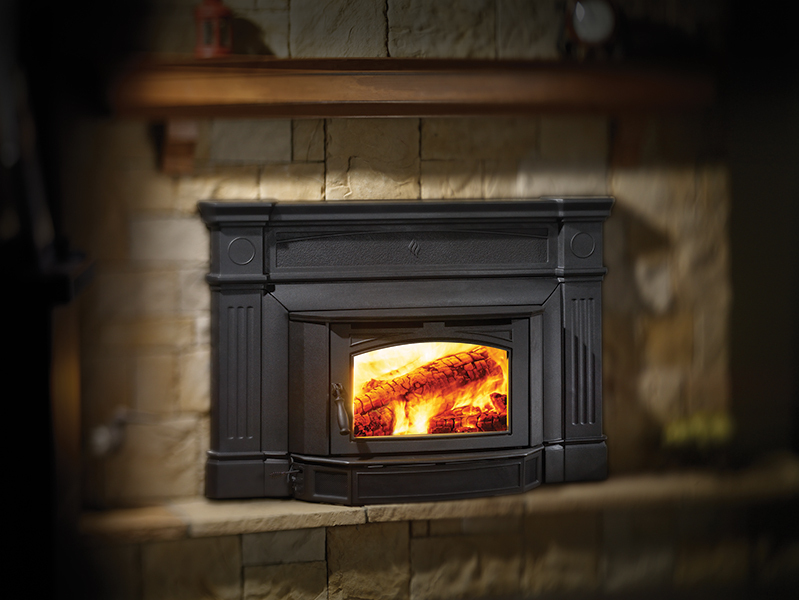 New wood stoves are more efficient and a lot safer than the older stoves. You have choices of catalytic and non-catalytic. 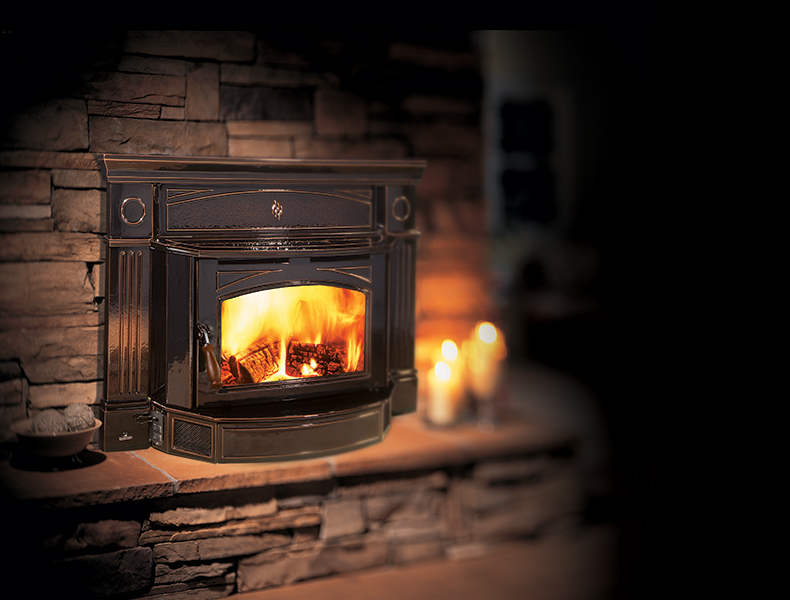 Still today, you will have many choices of steel and cast stoves with an array of different finishes with front load, side load and top load options all with 14″ – 20″ log length capacity. We have a broad selection in our showroom to satisfy your needs. When installed correctly, it may not change your insurance rates! Stop by our showroom today and see them all! 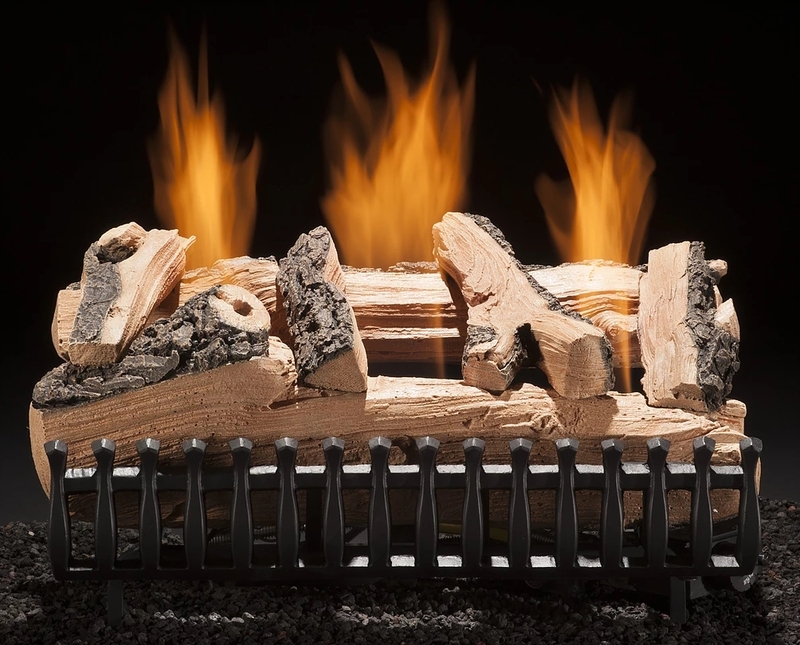 Electric fireplaces, including electric stoves, have come a long way from the orange light bulb and silver tinsel from years past. Installation takes just minutes. Just assemble, and plug it in! 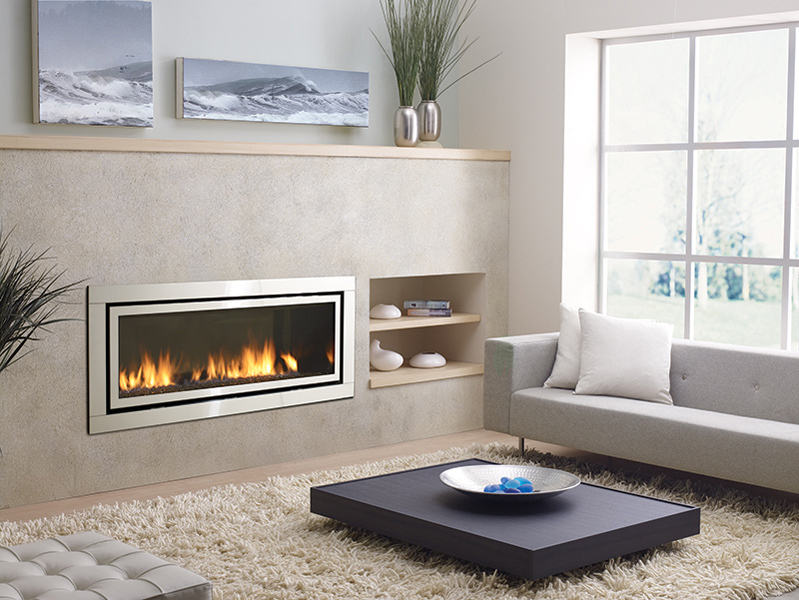 We have many electric fireplaces on display with an array of different mantle styles to fit any decor and price range. They also have 5,000 BTU heaters to help make the space warm and cozy for those cold winter nights! 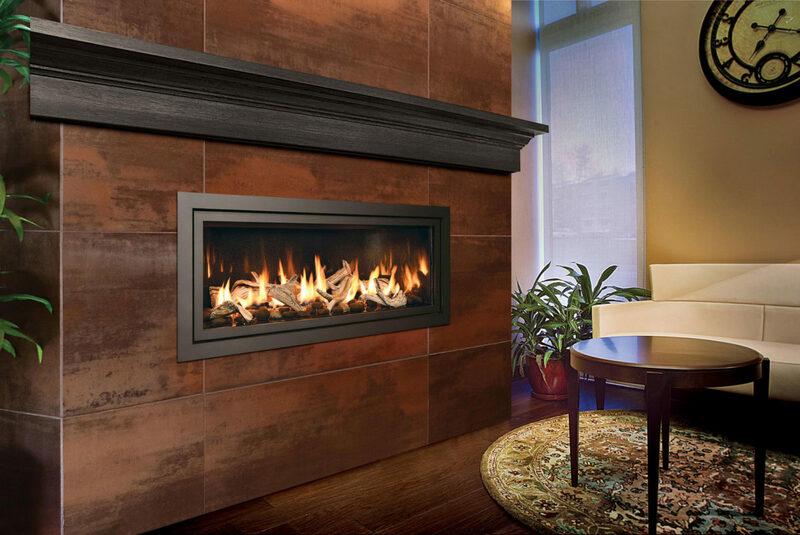 There are many sizes and styles of fireplace inserts including gas, wood, and electric. 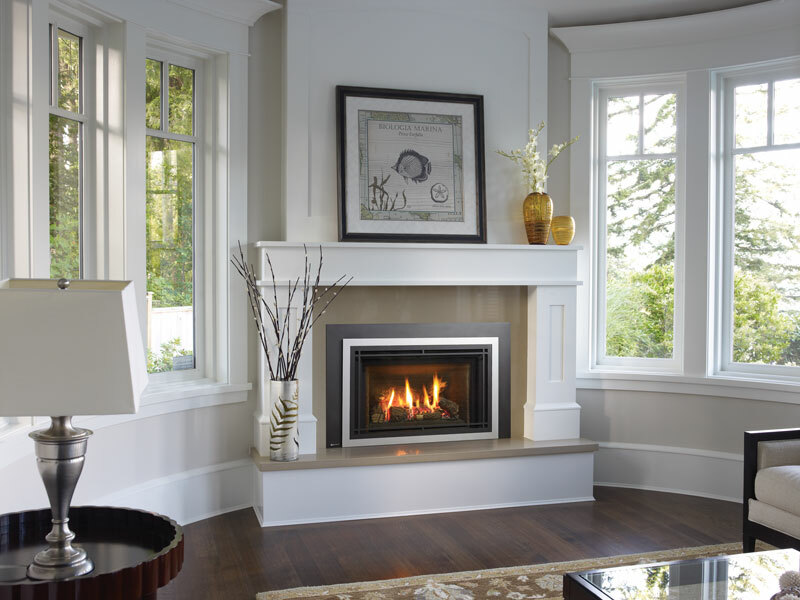 An insert is a smaller fireplace that is designed to fit into your existing wood fireplace to make it more efficient and safer to operate. 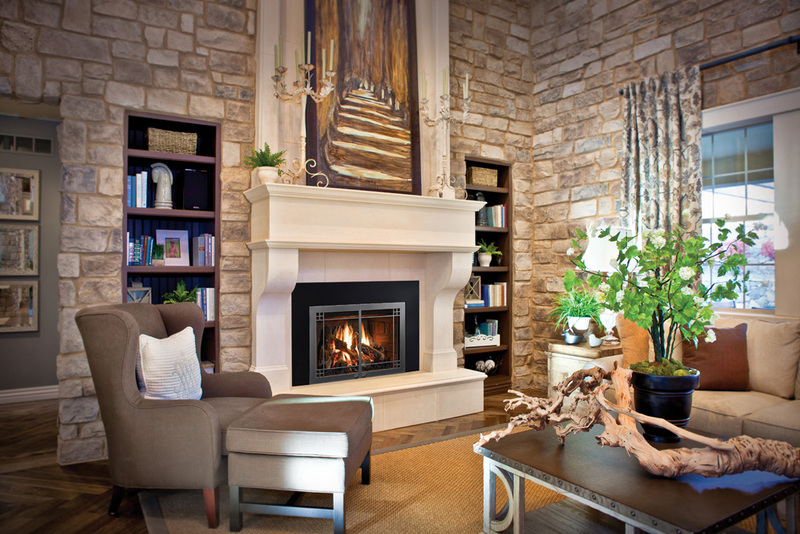 Plan a day to stop by our showroom and check out all we have to offer in fireplace inserts! Click on your fuel below to learn more. 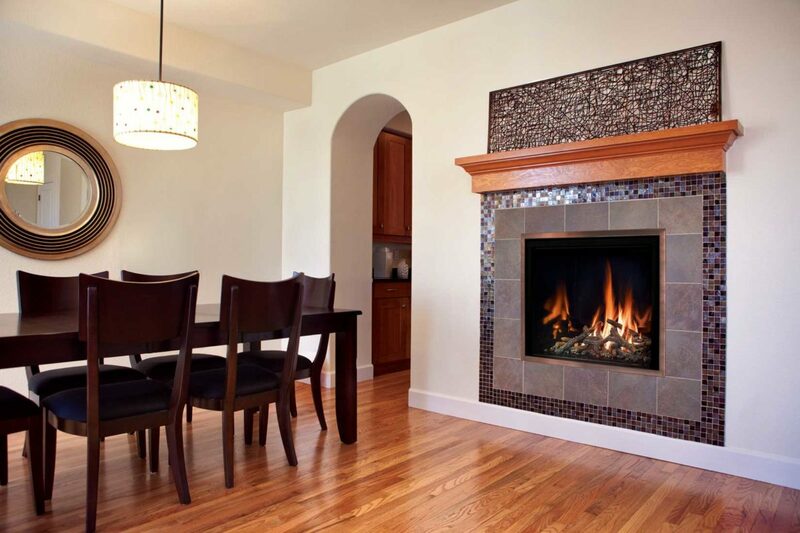 Gas inserts come in numerous sizes and are designed to fit inside the existing wood fireplace. They have 2 small flues that run through the existing flue pipe. There are many doors, trim, and interior liners available. To see all we have available, please stop into our showroom! Wood inserts come in three standard sizes, small, medium, and large. 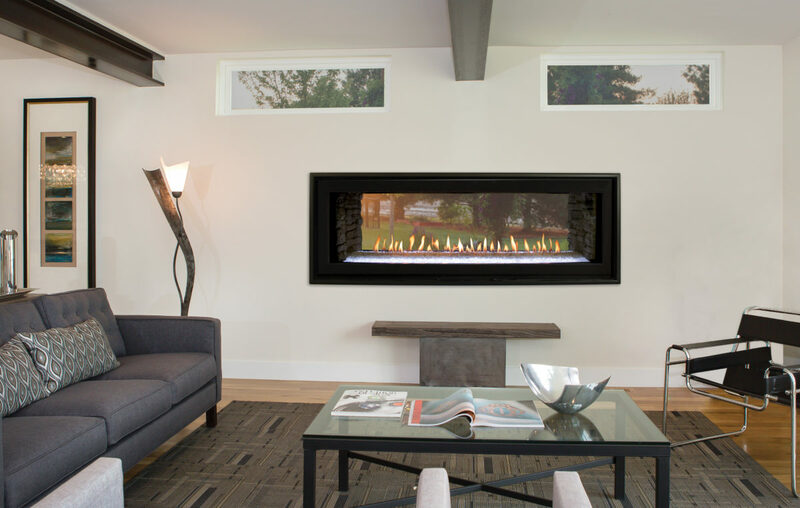 They fit inside the existing wood fireplace and have a 6″ stainless steel liner that runs up to the roof through the existing flue pipe. There are many options for these wood inserts, so stop by our showroom today to take a better look! 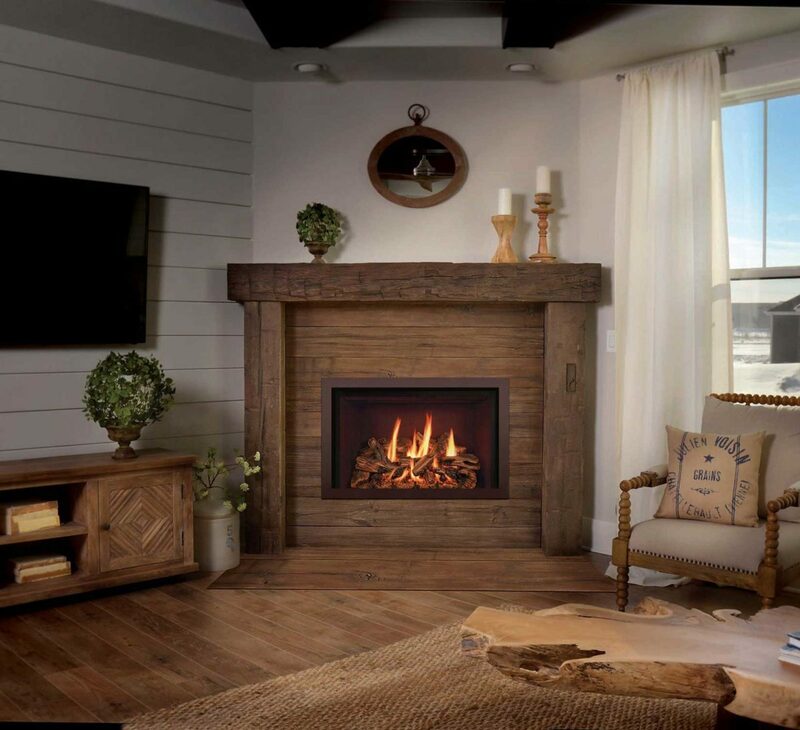 You can convert that drafty old wood fireplace to electric with an electric insert that looks like a real wood fire with a 5,000 BTU heater to add warmth to your room. 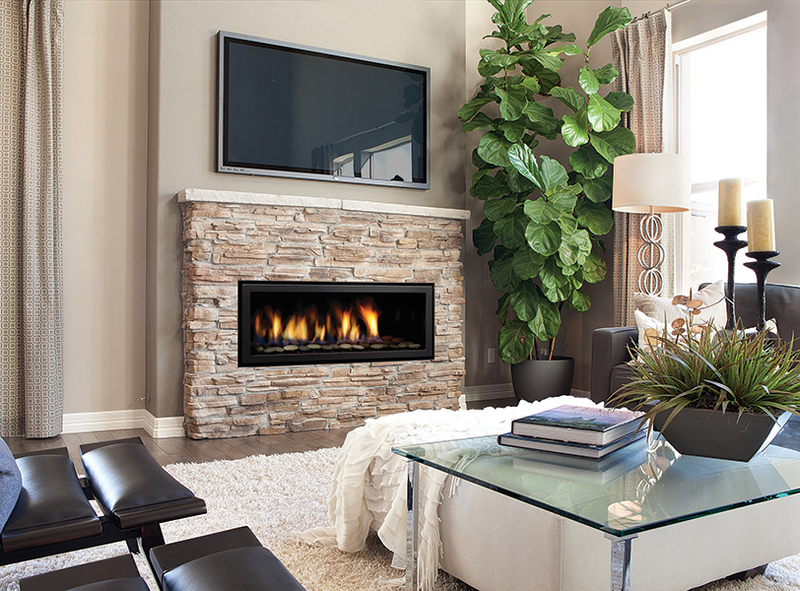 You will be surprised how often you use your fireplace with an electric insert. 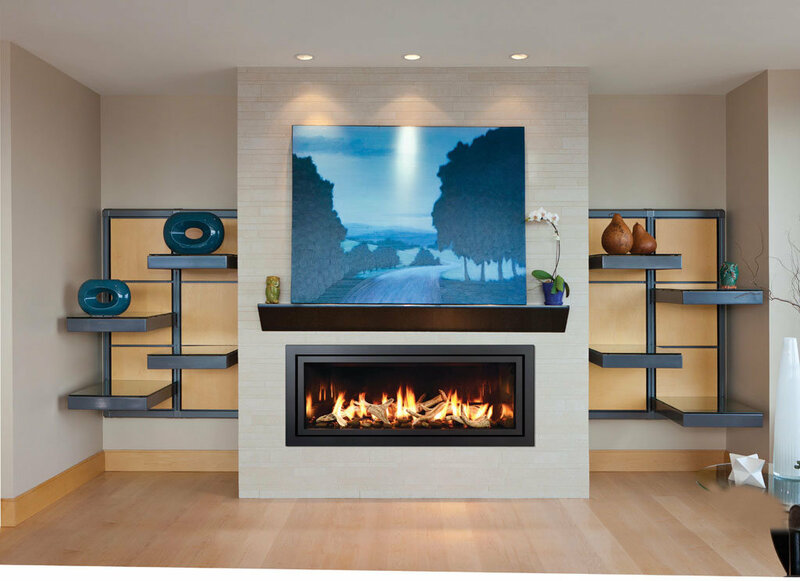 Fireplaces and stoves have many different accessories you can add to make them as functional and brilliant as they can be. We have glass doors, screens, blowers and remotes for your convenience. Click on the accessory below to learn more. 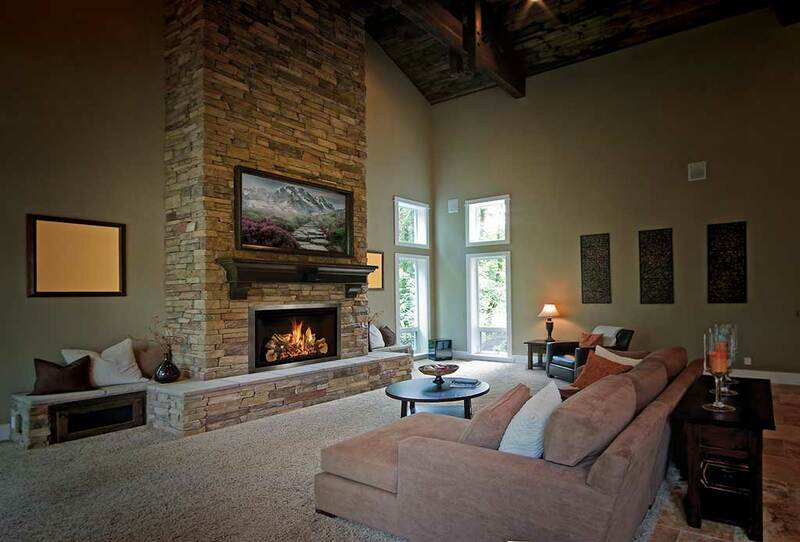 Want to get the most out of your fireplace? 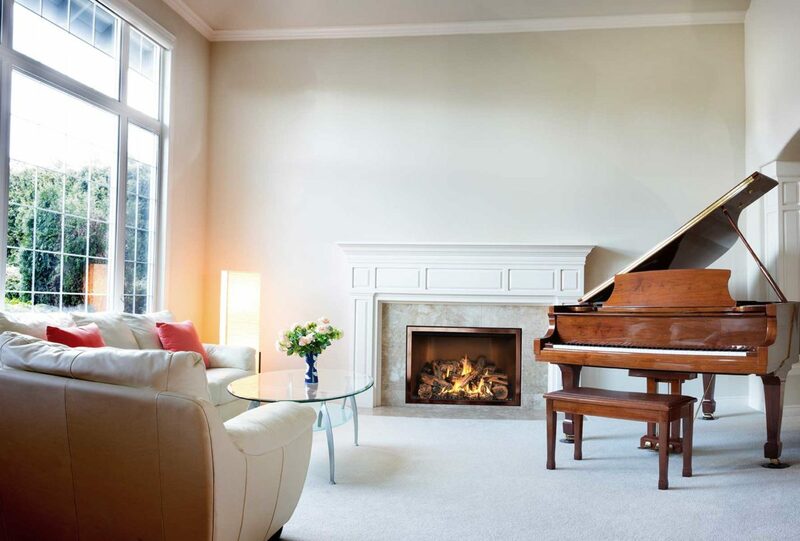 Adding a heat circulating blower to any fireplace is a smart edition. Most are variable speed and heat activated. A blower greatly aids in speeding up the distribution of heat in your home. Stop by our showroom or contact us with any questions. Please have your fireplace model and serial number ready. (364-4328 or info@colonyheating.com) for more information. 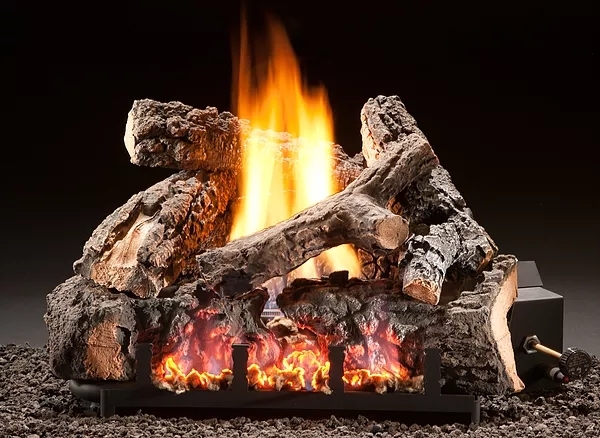 Imagine being curled up in a nice warm blanket on a cold winters day and being able to have control over your fireplace with the click of a button. There are many styles of remotes depending on your needs. 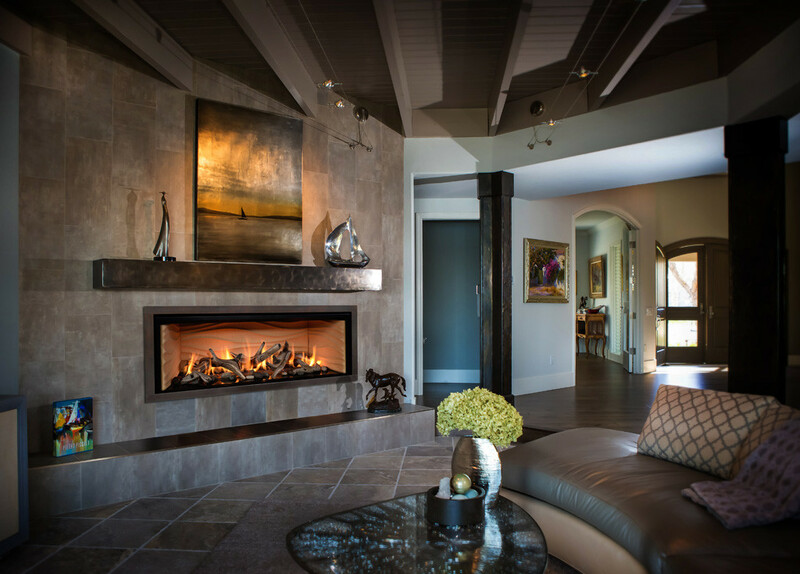 We offer a basic on/off remote and an on/off remote with a thermostat that can likely be installed in your existing gas fireplace or stove. 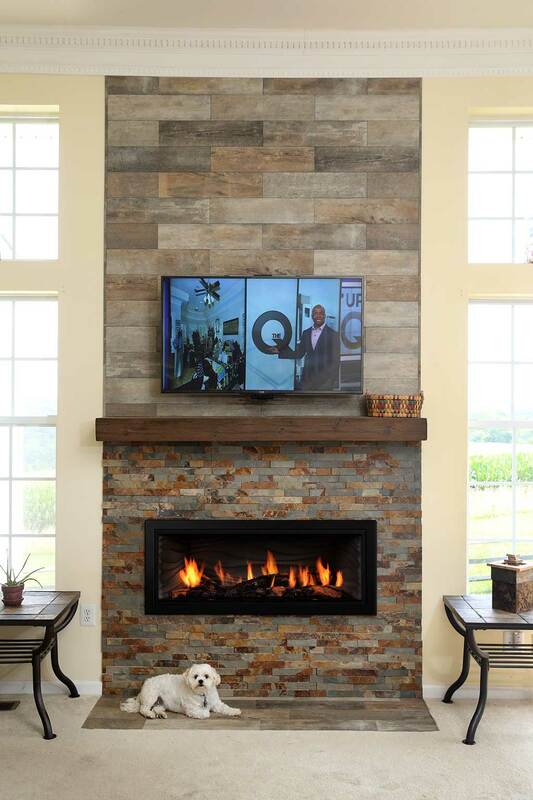 The higher-end gas fireplace models will include a full-function remote (as seen in the picture) that will allow you to have full control over your fireplace. 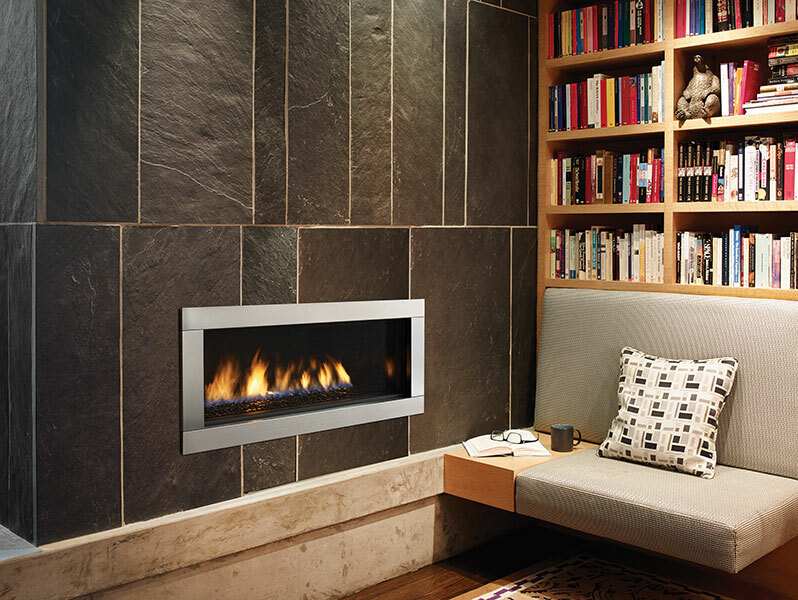 This remote allows you to control the flame height (BTU output), blower speed, dimmer light inside fireplace (if applicable), and will include a thermostat. Stop in or give us a call with any questions! 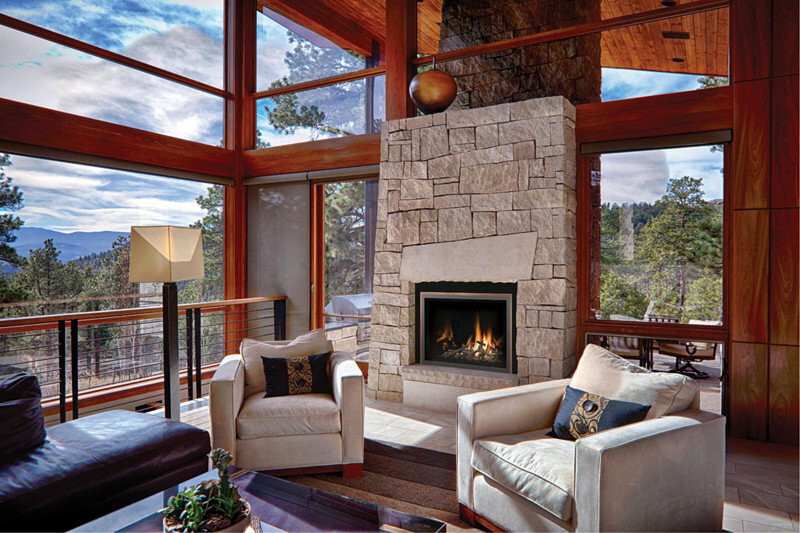 Gas logsets are designed to be installed in an existing wood fireplace and vent through the existing flue pipe. There are many styles and sizes ranging from 15" to 36". They light with a lighter or by remote. Stop by our showroom and see our ever expanding selection! Our service area may go further than you know! We stand behind all our new installations for one year and are more than happy to service other brands at a competitive labor rate if any problems occur after that first year is complete. Call in today to make your appointment. Call the Guys you Can Trust! 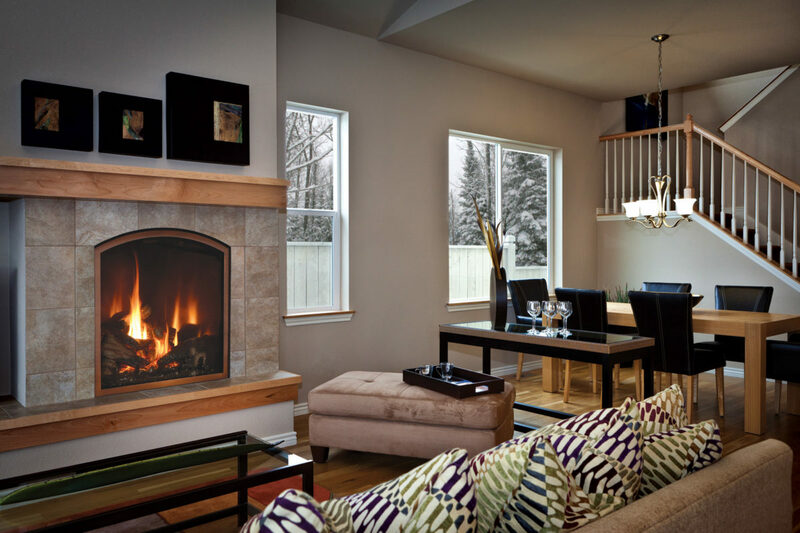 Have you ever wondered what a Direct-Vent fireplace system is? 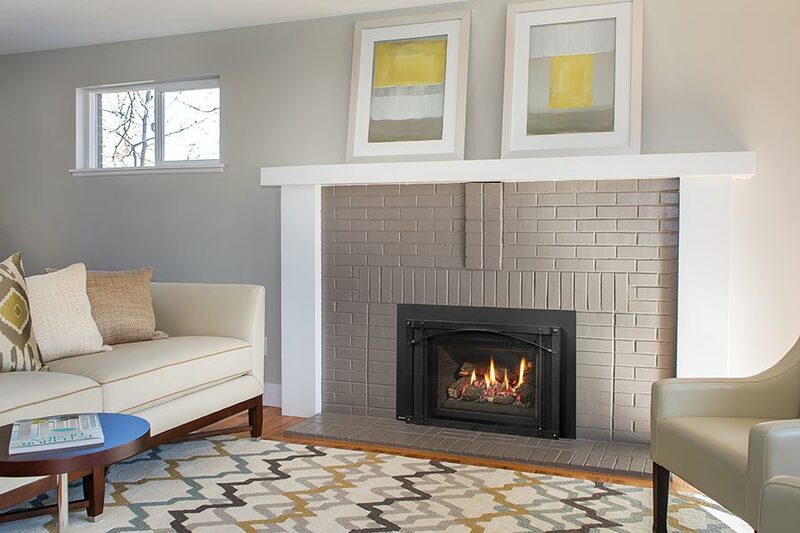 We've got all the common fireplace terms all wrapped up into one easy glossary. Check it out! 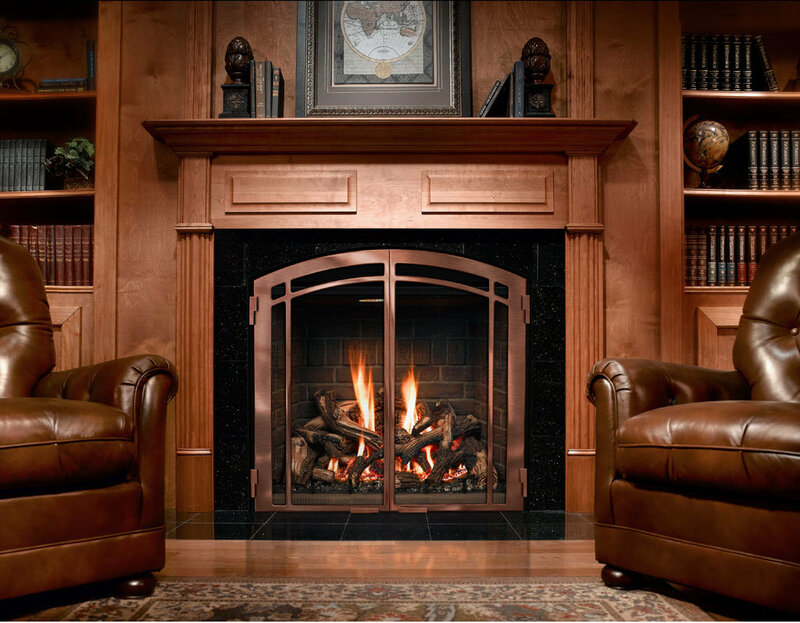 Any questions about any of the terms you have, just call in and ask for one of our fireplace experts! 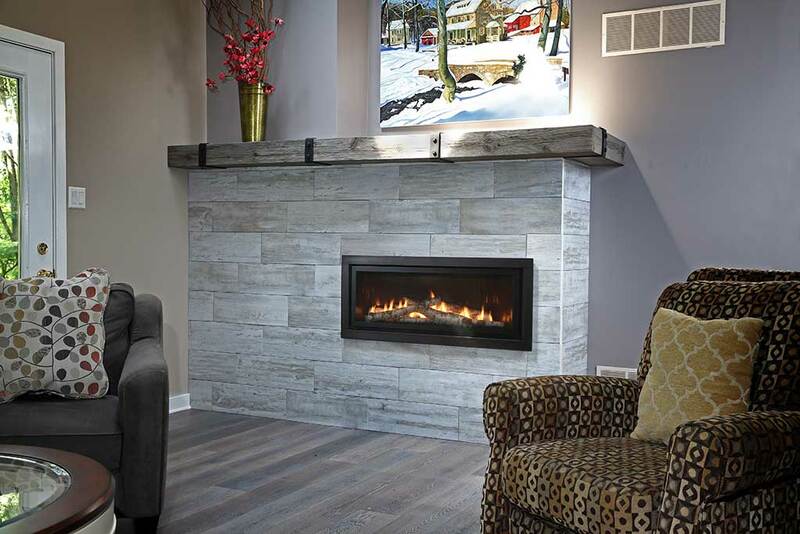 Colony is the best new fireplace retailer and installer in Cedar Rapids, North Liberty and Iowa City. 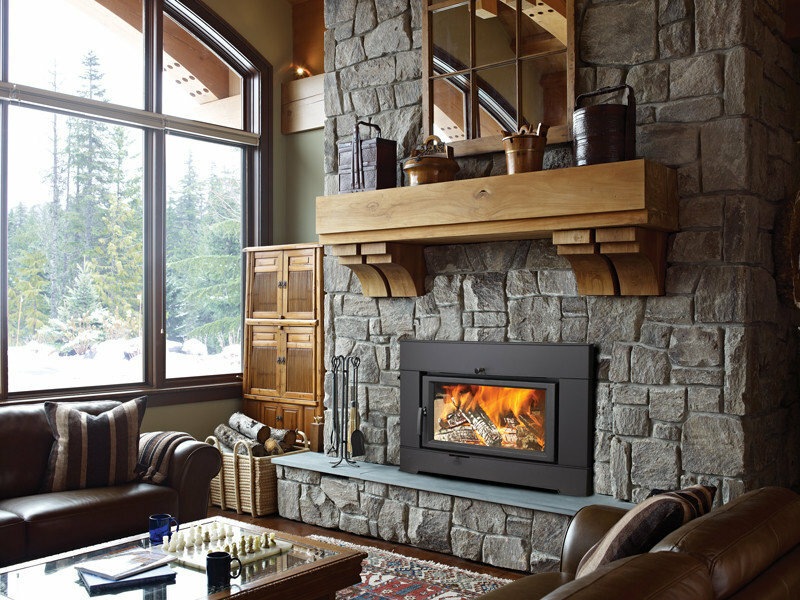 The following definitions will help you understand common terms used in the description of hearth products. 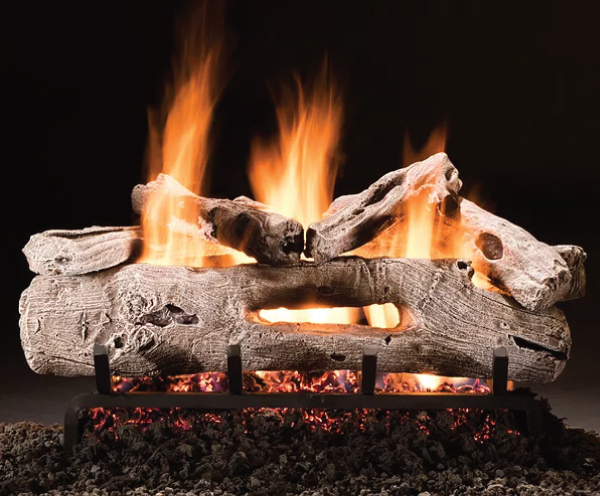 Many fireplaces and log sets are designed to be purely decorative, meaning they only deliver low radiant heat or no heat at all (typically electric fireplaces fall into this category). 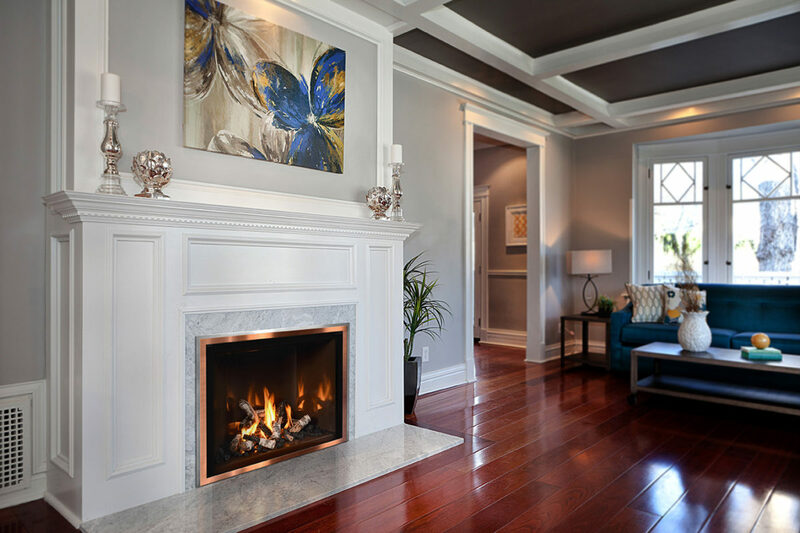 Many fireplaces and stoves are designed to be a heat source, adding supplemental heat to your living space by circulating warm air through convection or through a fan. The amount of BTU output will help determine the amount of heat that will be delivered into a room. The higher the BTU, the more square footage can be heated. 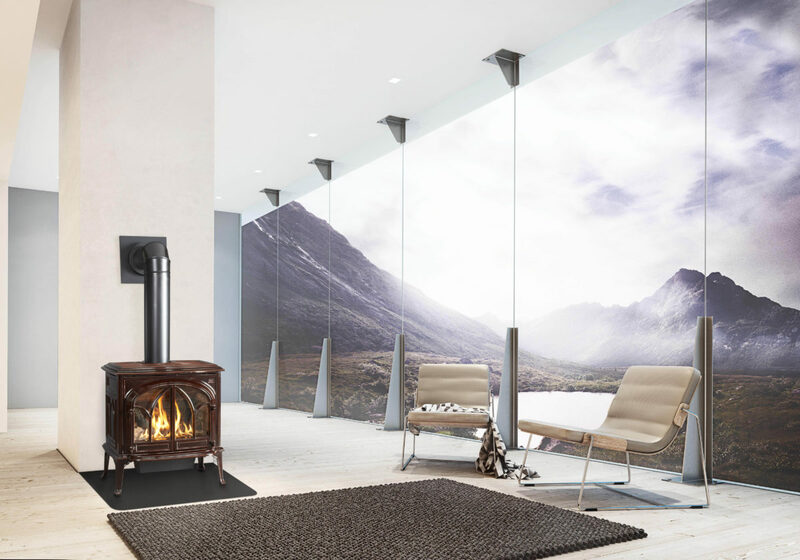 Colony offers a variety of fireplaces and stoves that meet U.S. Environmental Protection Agency (EPA) and EPA-Phase II guidelines for clean-burning efficiency. 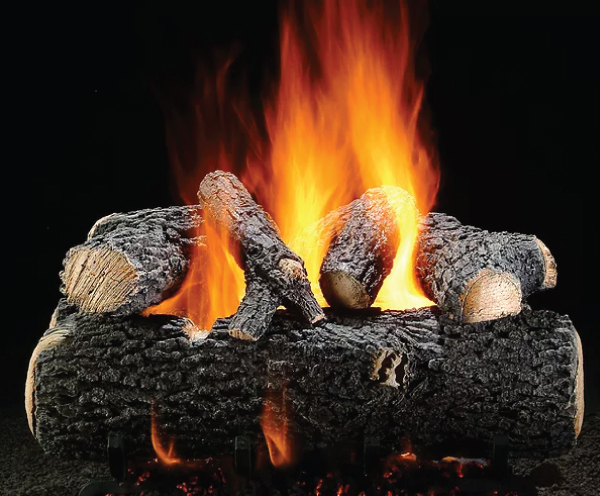 Many areas require EPA certification for wood-burning appliances. Check local codes. 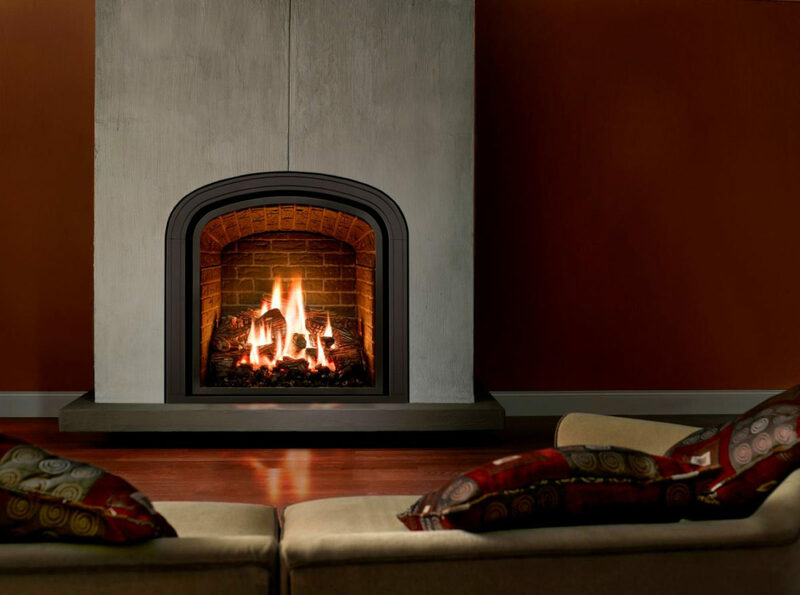 When choosing a hearth product, fuel type is the most basic decision you must make. Here are a few things to consider. 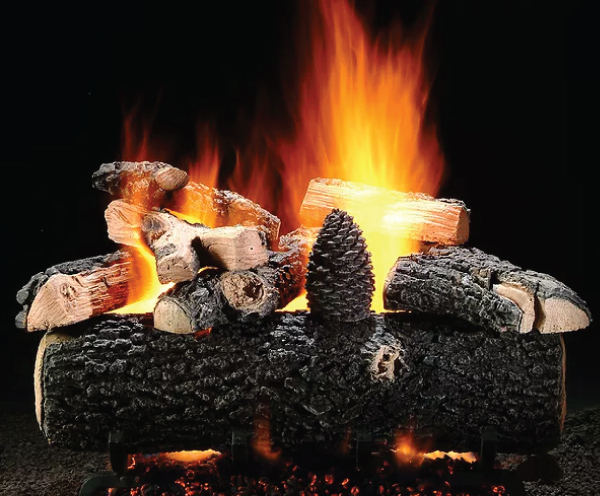 Note: Several regions around the country have specific local regulations regarding emissions from wood and pellet-burning appliances. Please check with your local code before choosing a specific fuel type. 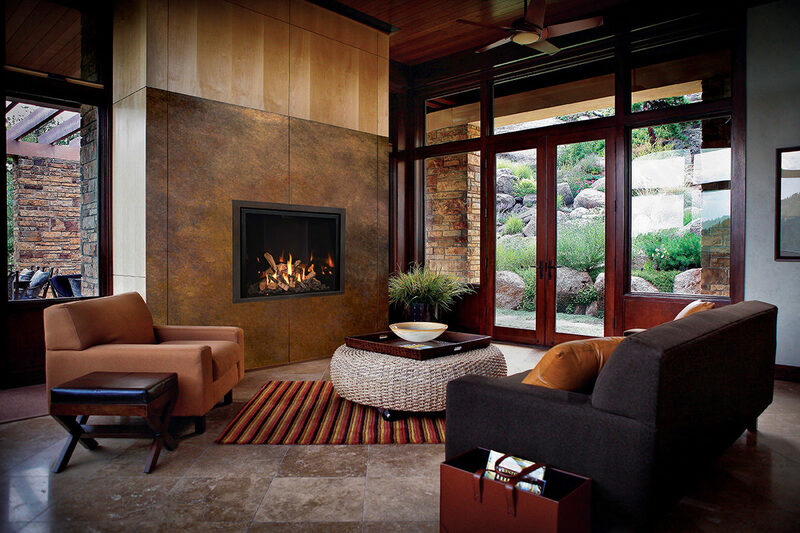 A wood-burning fire provides optimal visual entertainment and is ideal for both heating and decorative hearth products. From brilliant and blazing to slow and steady, there is a natural ebb and flow to the flame with constant action. 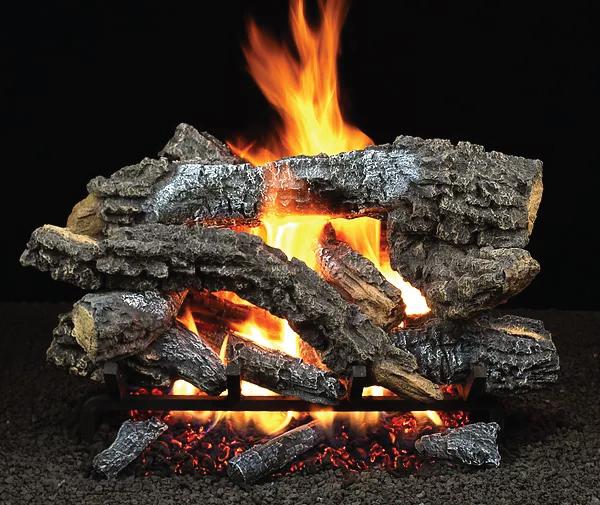 Wood also adds the elements of crackling, popping and hissing. 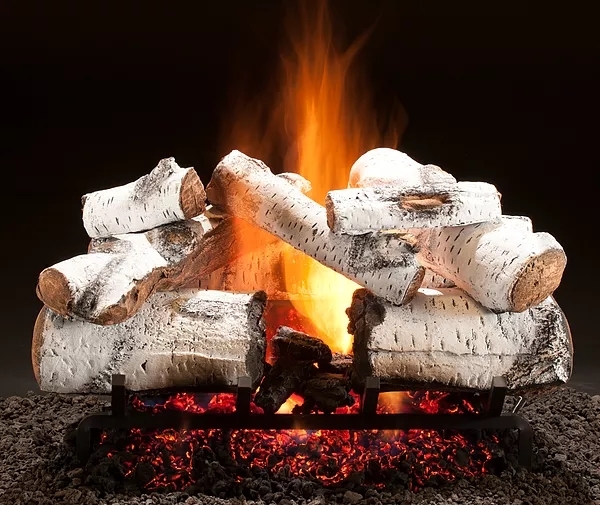 Wood-burning products require attention, clean and loading. High-efficiency models help reduce the amount of fuel and effort needed to maintain the fire. Quality, availability and price of wood will vary from region to region. 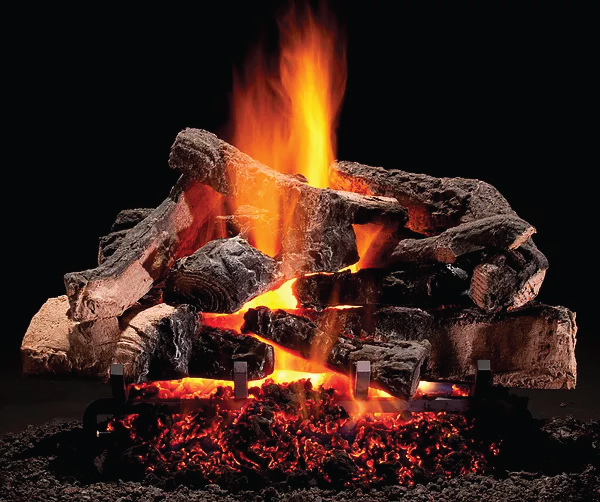 A gas fire delivers the peaceful ambiance of wood-burning fire, but flames are more even and consistent. 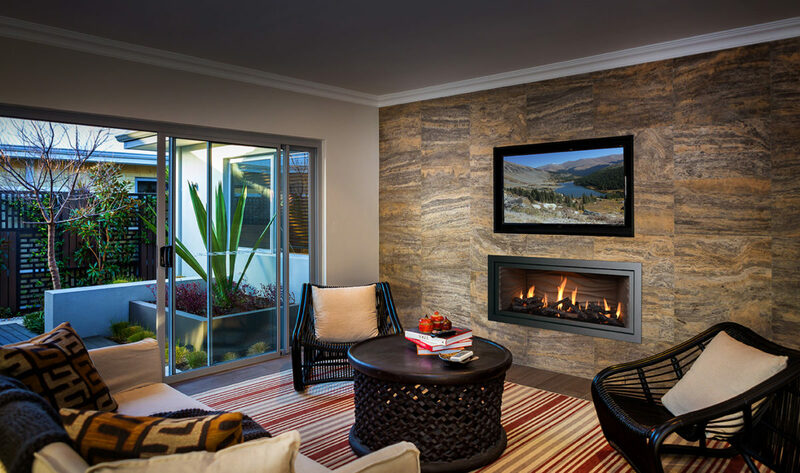 Gas fireplaces and stoves require almost no effort to start and maintain and are often remote-controlled or feature an easy-access control panel. 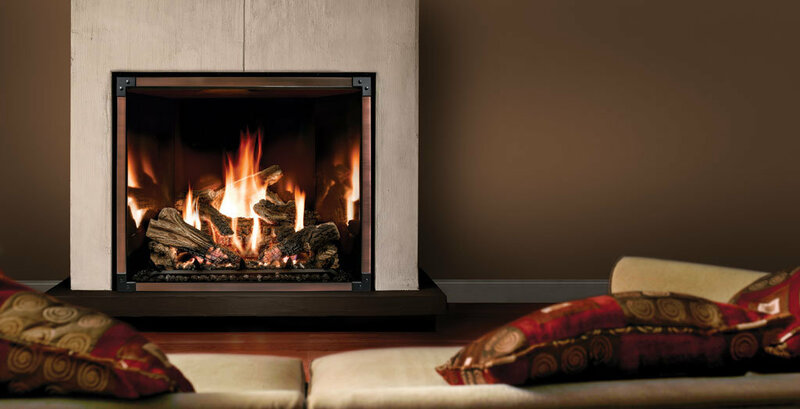 With several heater-rated models, the flame height and intensity can be adjusted. 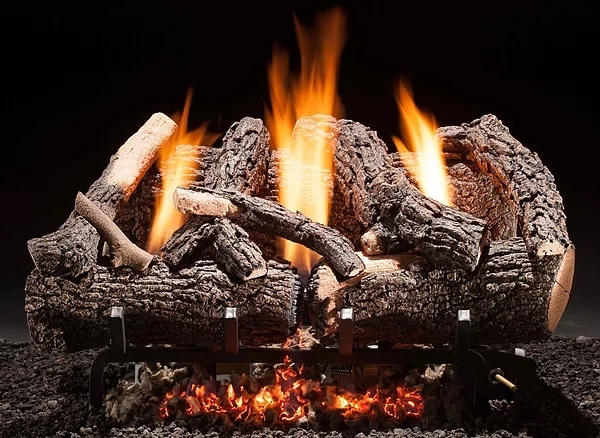 Gas log sets are ceramic and designed with fine details like charged edges, textured bark and a glowing ember bed to maintain an authentic feel. Gas products are available to operate with propane (LP) or natural gas. 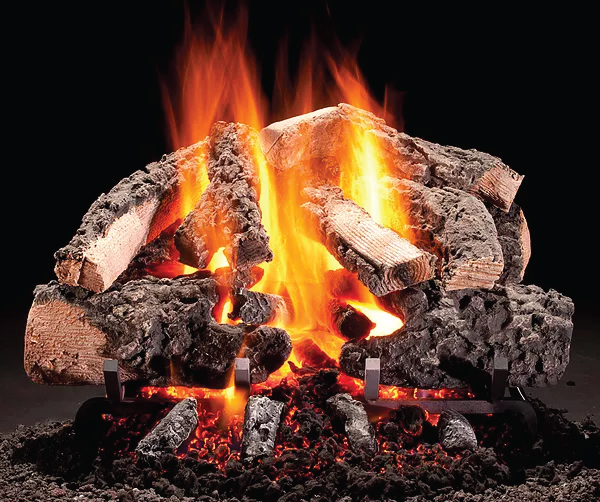 An optimal fuel for heating hearth products, pellets offer a unique and dramatic fire experience and deliver powerful, dense heat. 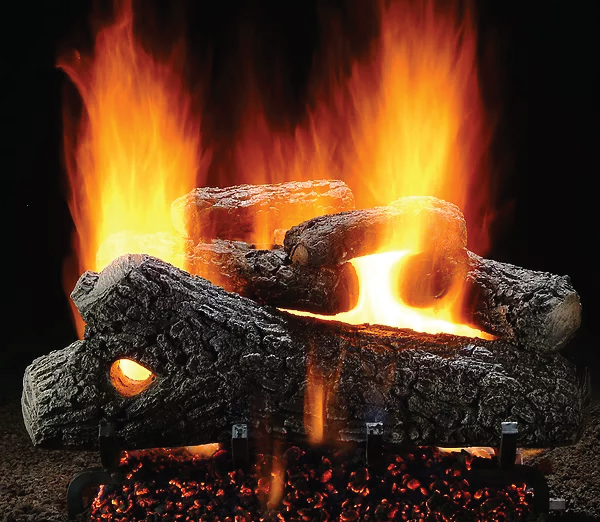 Compared to wood, pellet-burning products are inherently more convenient. Large hoppers and automatic feed systems eliminate constant tending to the fire and burnout. 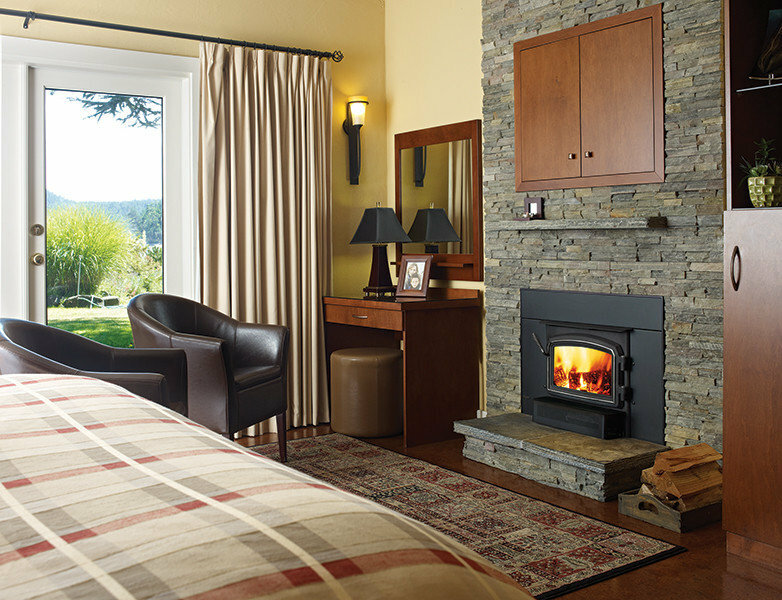 Pellet appliances do require cleaning and fuel needs to be loaded periodically. Fires tend to be very active and constant. The flames are dense and powerful, offering a brilliant glow. Quality, availability and price of pellet fuel will vary from region to region. 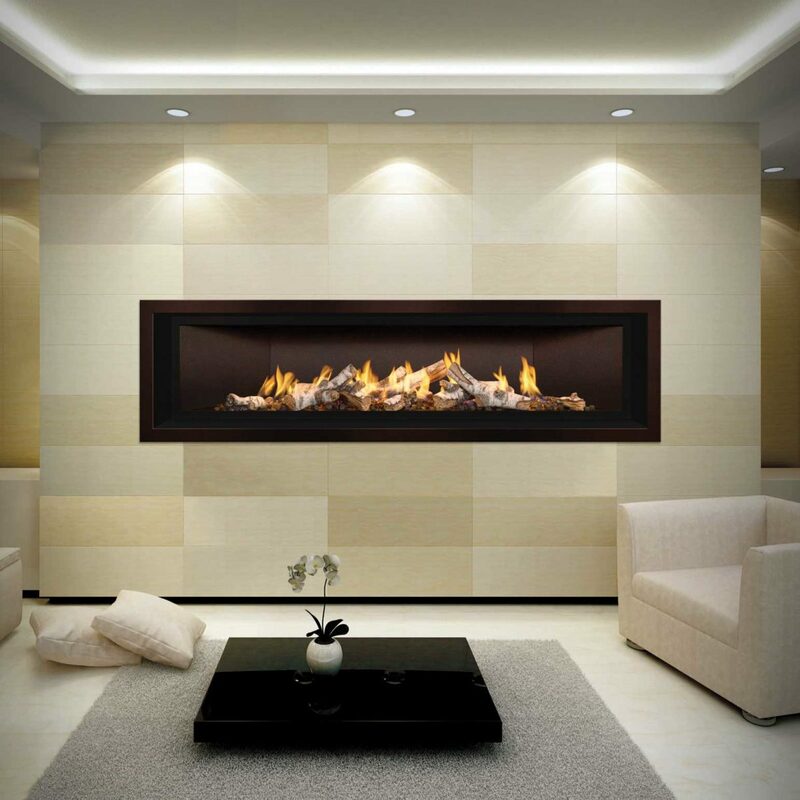 Electric fireplaces use light projection to simulate a burning fire. 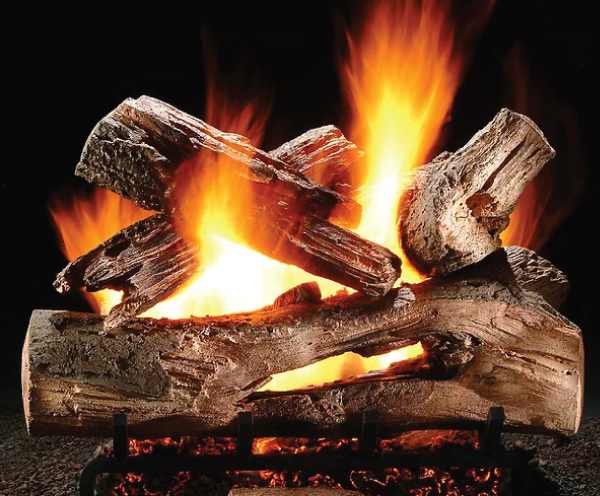 Electric fires often have similar characteristics of a gas fire with constant flame activity. 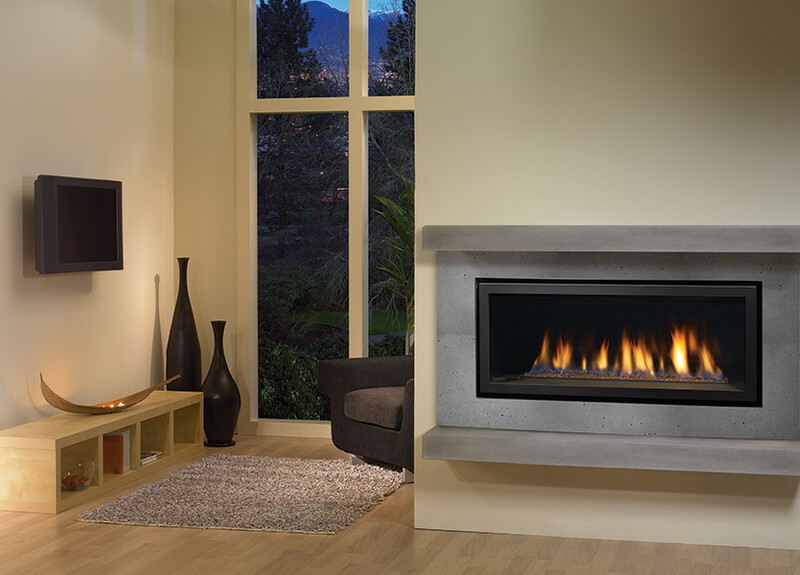 Electric fireplaces and stove require almost no effort to start and maintain. The home environment, type of appliance, altitude, weather, and installation requirements often dictate what venting option is appropriate. Be sure to consult a professional, builder or remodeler before making a decision on venting. Note: Several regions around the country have specific local regulations regarding vent-free or ventless products. Please check with your local authority before choosing one of these products. 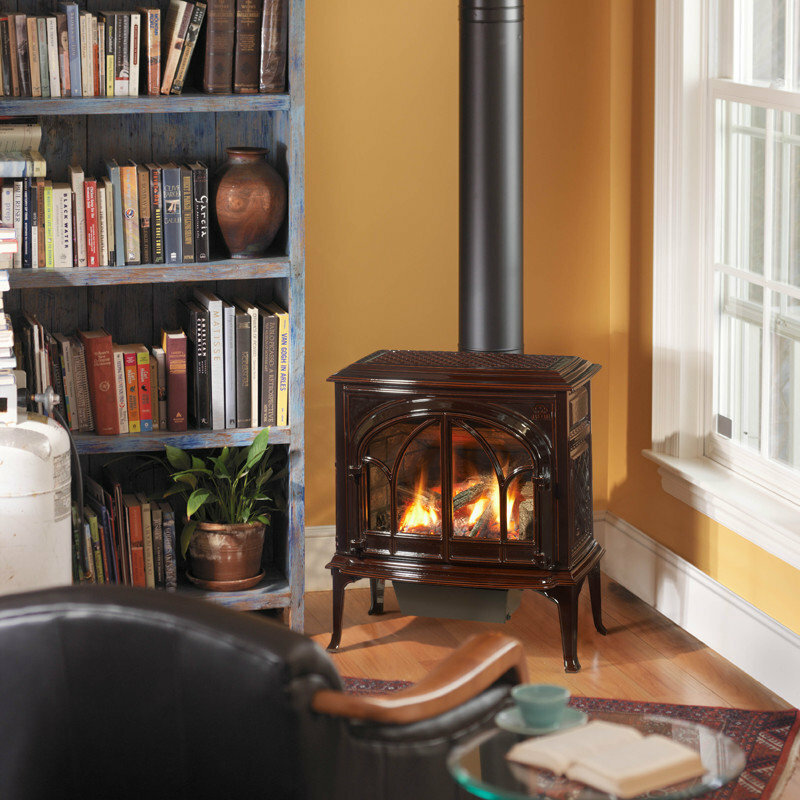 Wood-burning products offer a chimney as the venting option. 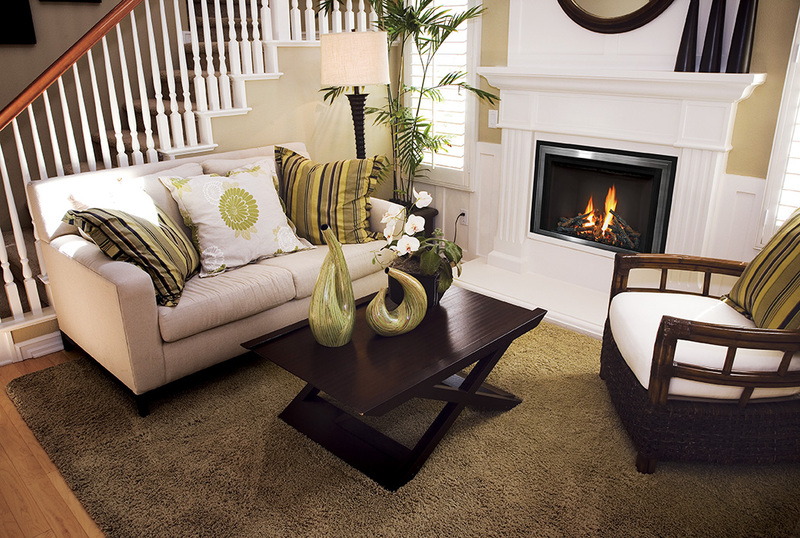 Pellet-burning products offer a fan-assisted vent for venting. Direct-Vent: Receives 100% of combustion air from outside the home for greater efficiency and is ideal for airtight homes. 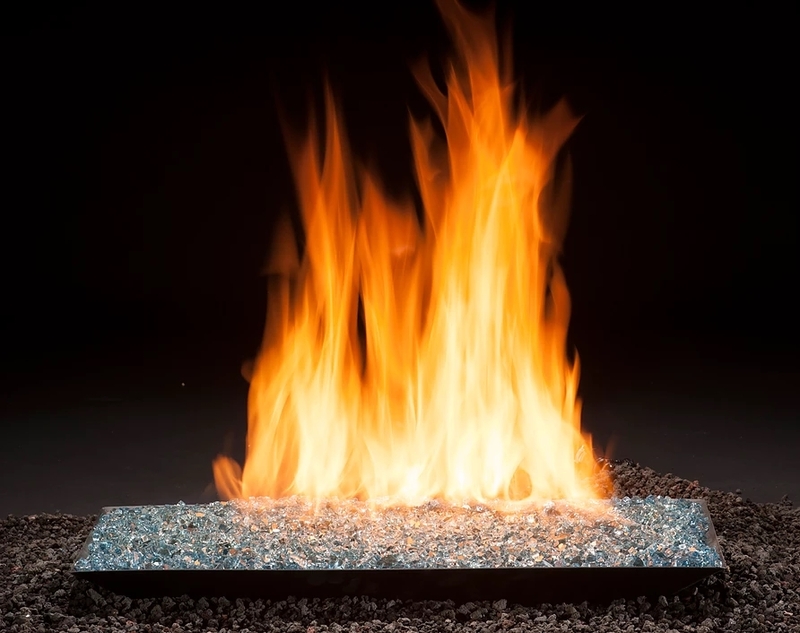 Also features tempered-or-ceramic-glass panels that seal the combustion area from the home for efficiency and safe indoor air quality. 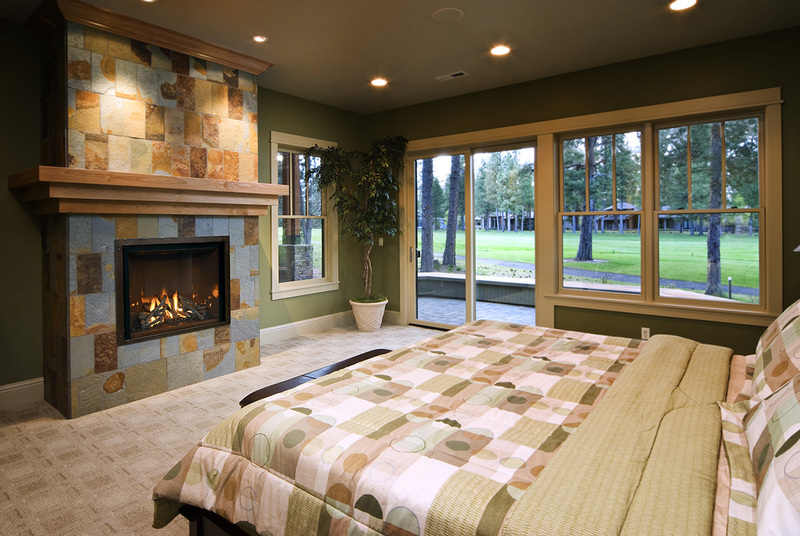 B-Vent: Draws combustion air from within the home and vents combustion exhaust to the outdoors. 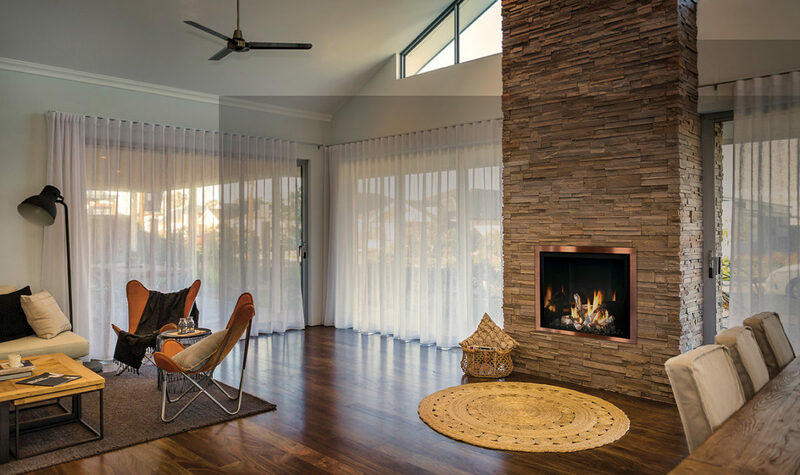 Vent-Free or Ventless: Draws combustion air from inside the home and is designed to burn so efficiently and completely that it eliminated the need for venting. 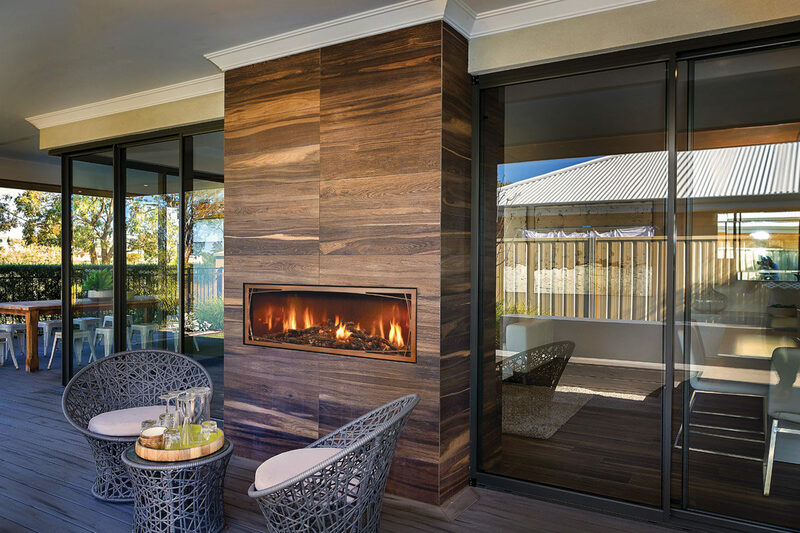 Glass doors and metal around the doors and grills can become very hot during operation and can remain hot even after the fire has gone out or has been turned off. Be sure that all adults and children understand the safety precautions and supervise all children in the same room as your product. 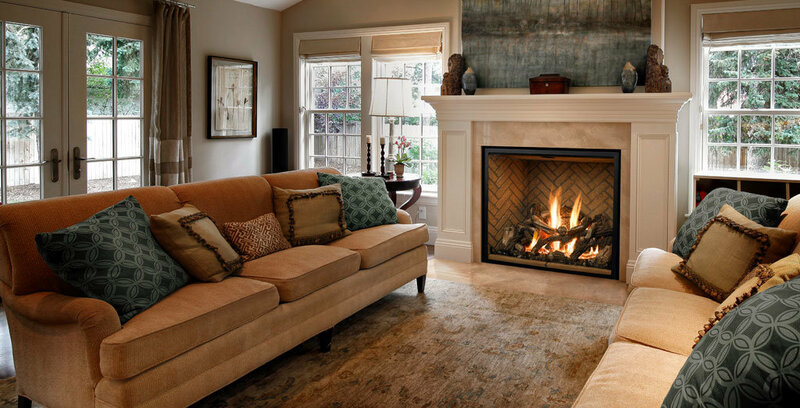 Keep furniture, draperies, clothing and other combustible materials at a safe distance from the fire.